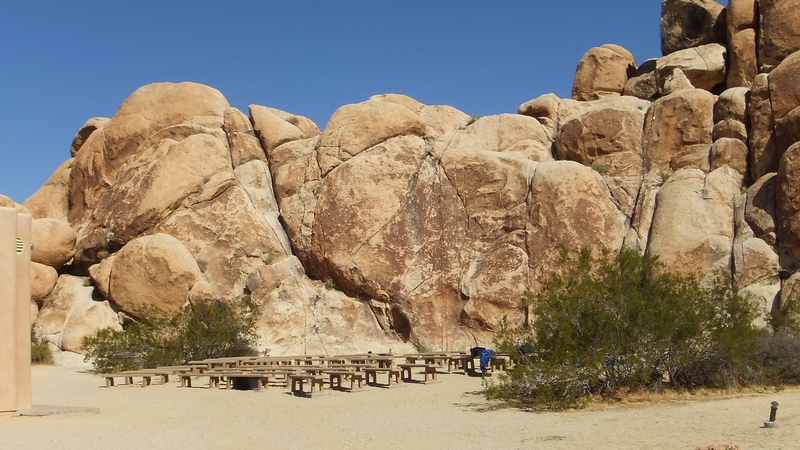 Parking lot with access to amphitheater, Campfire Crag north face, Circle Crag, and Jaime’s Rock area. 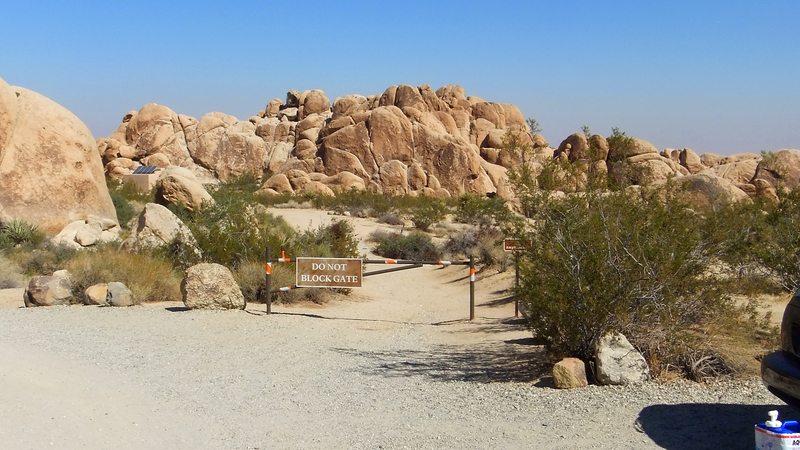 Also trail to Group Campground sites #3-4. 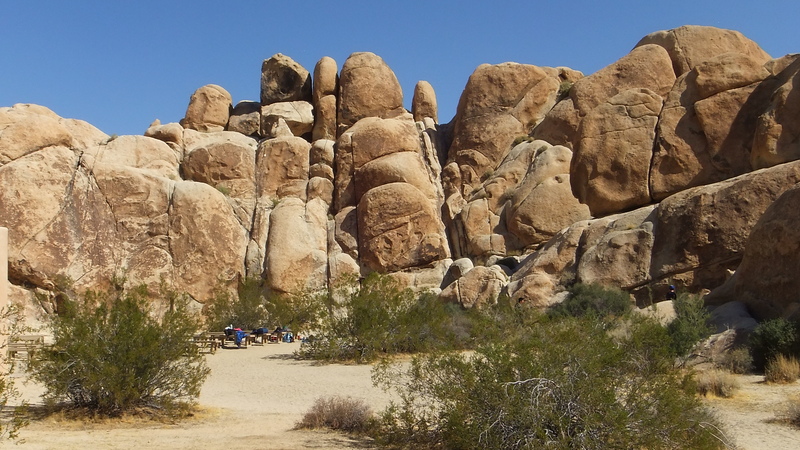 THE LARGE INDIAN COVE CAMPGROUND hosts 13 group campsites and 101 regular campsites; it lies at the high point of a large, sweeping alluvial plain that drops down both to the north and to the west into the city of 29 Palms. 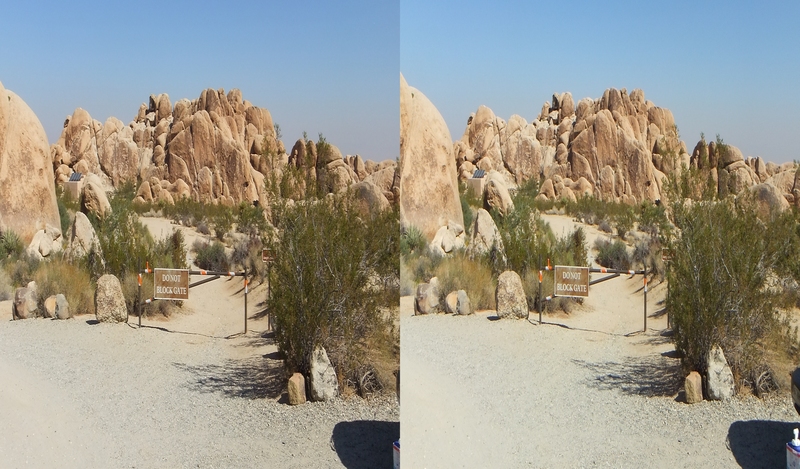 The Camp Entrance is at an elevation of about 3250ft. 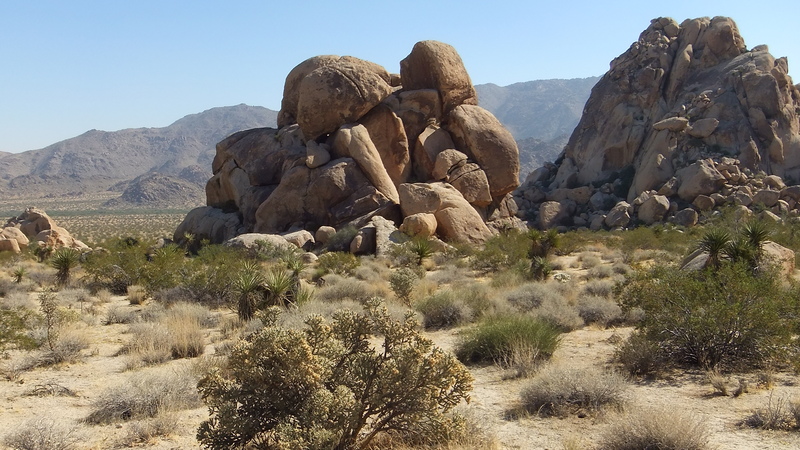 Because this is below the pine-tree line in Southern California (4000ft), there are no pinyon pines found here. 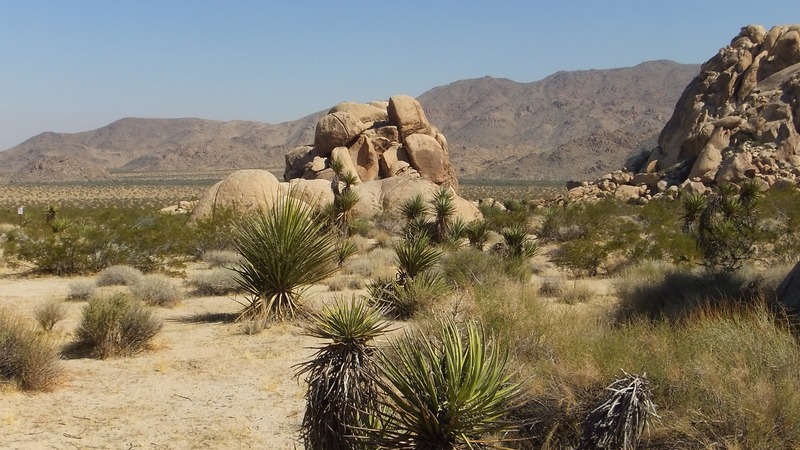 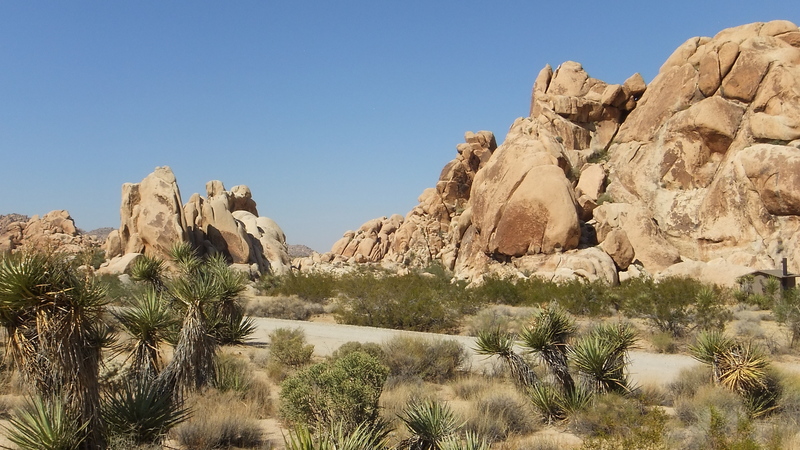 Oddly, there are virtually no Joshua Trees, either, even though these are common enough along Highway 62 below (200ft el.) 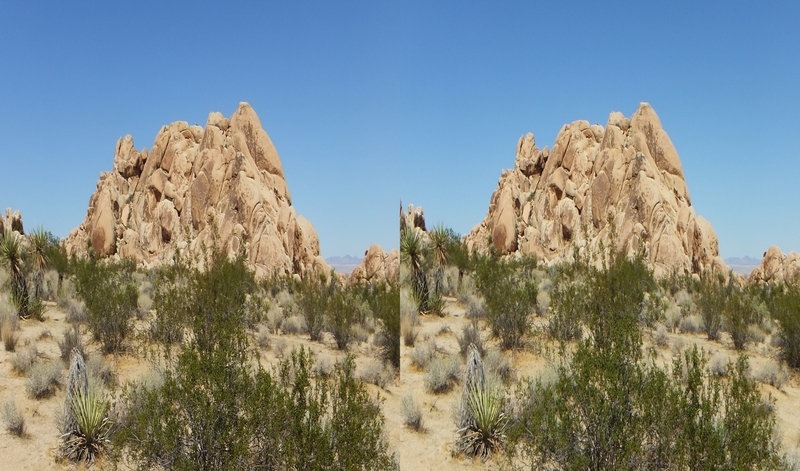 that connects the cities of Yucca Valley, Joshua Tree and 29 Palms. 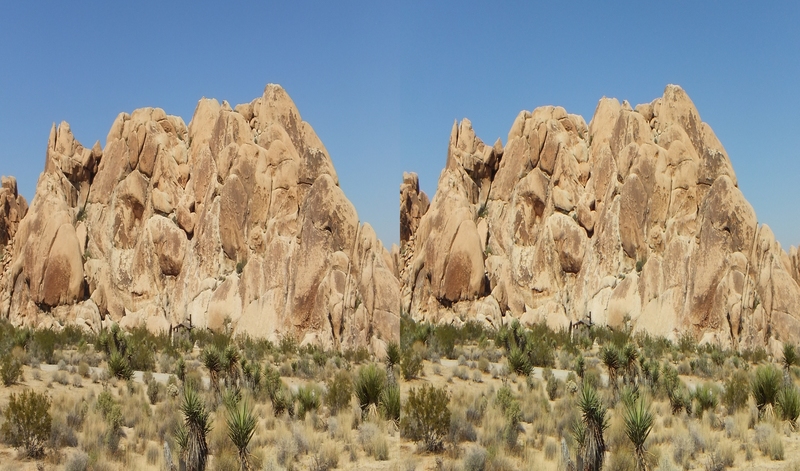 The Part 1 3D Gallery starts with the formations and campsites near the Amphitheater, which is situated in a small cove confined by (from left to right) Campfire Crag, with its appendage, Alpentine Wall, Circle Crag, and Jaime’s Rock. 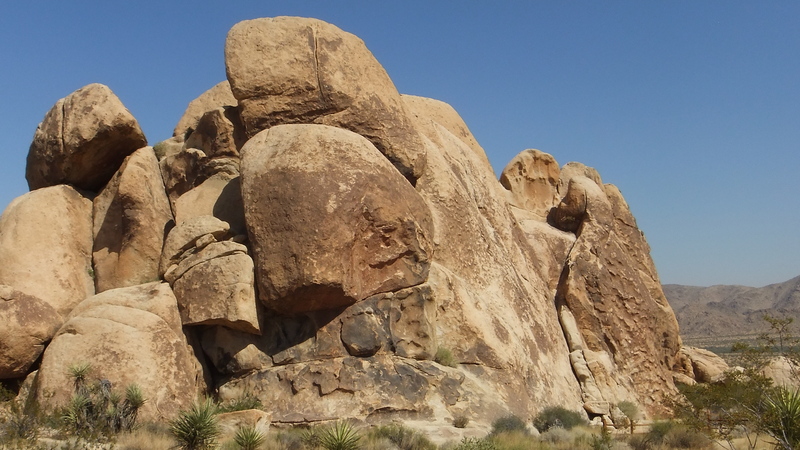 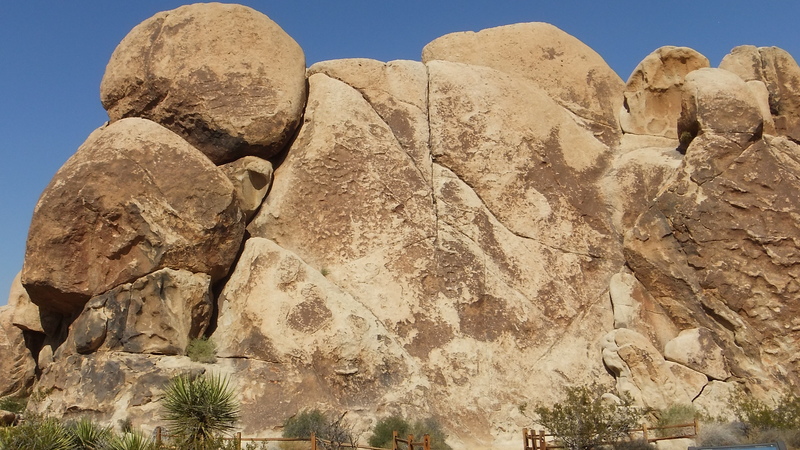 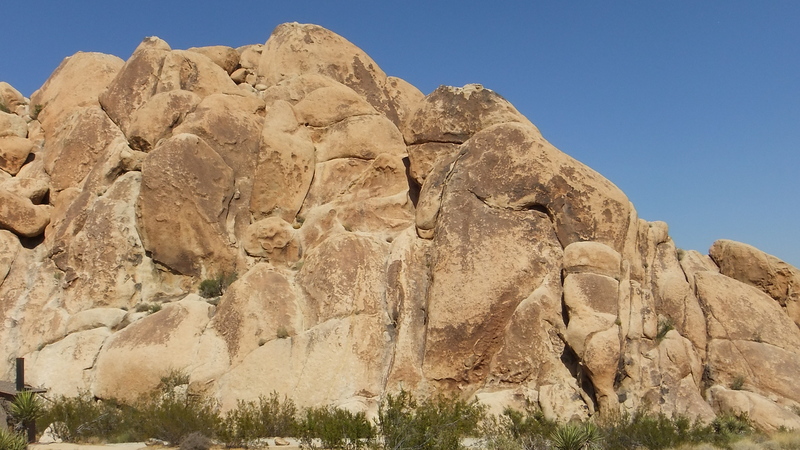 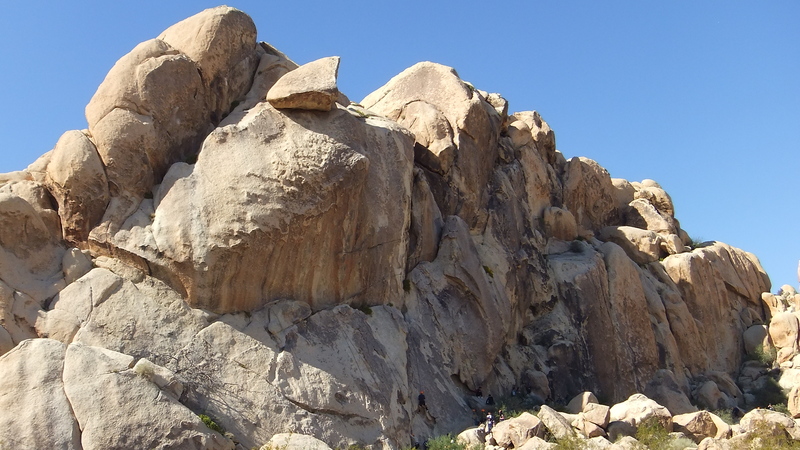 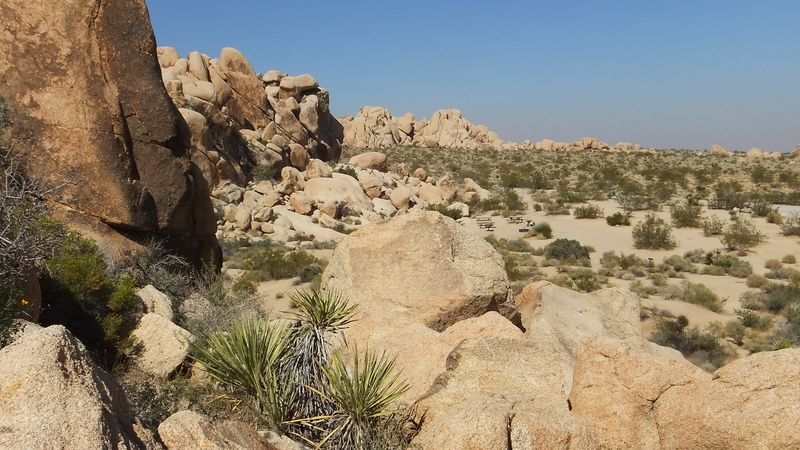 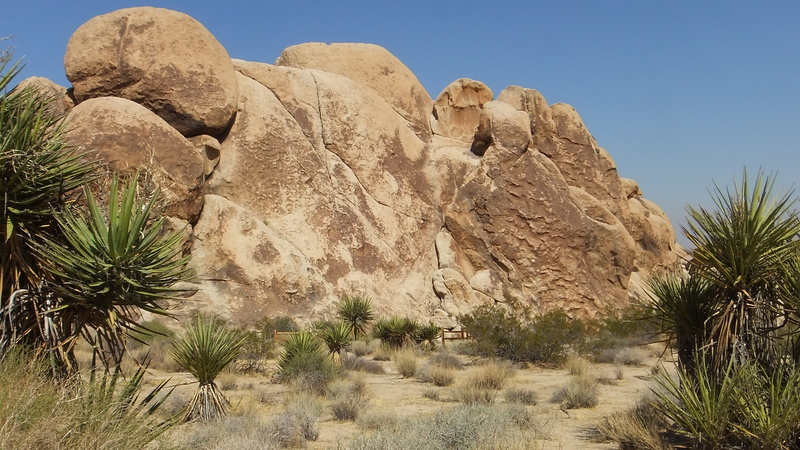 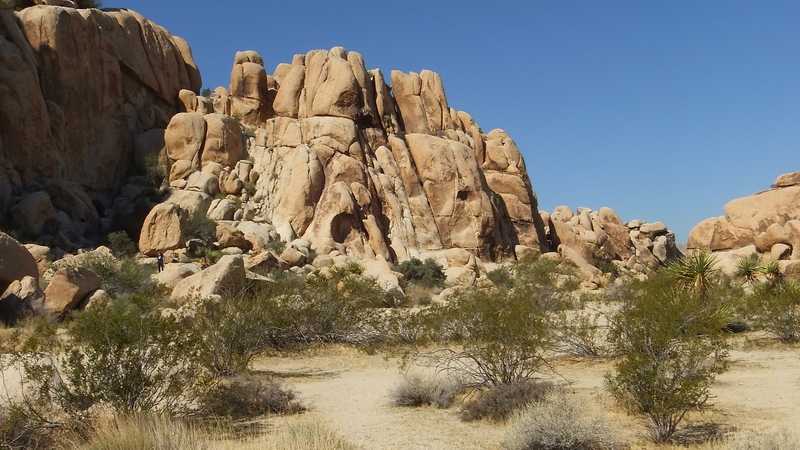 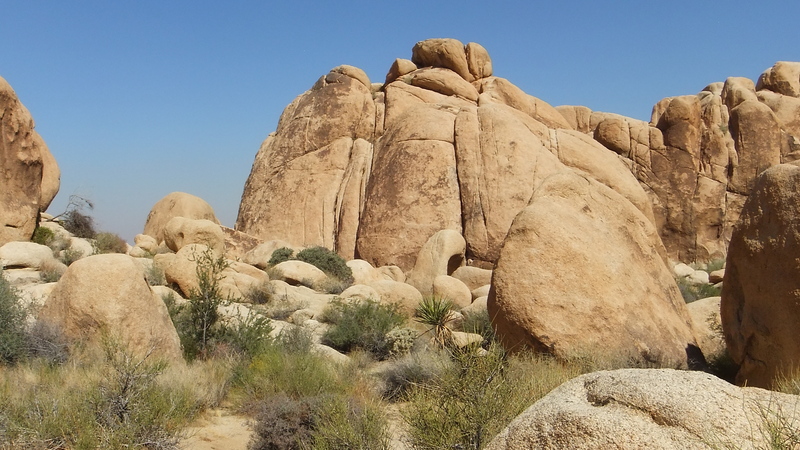 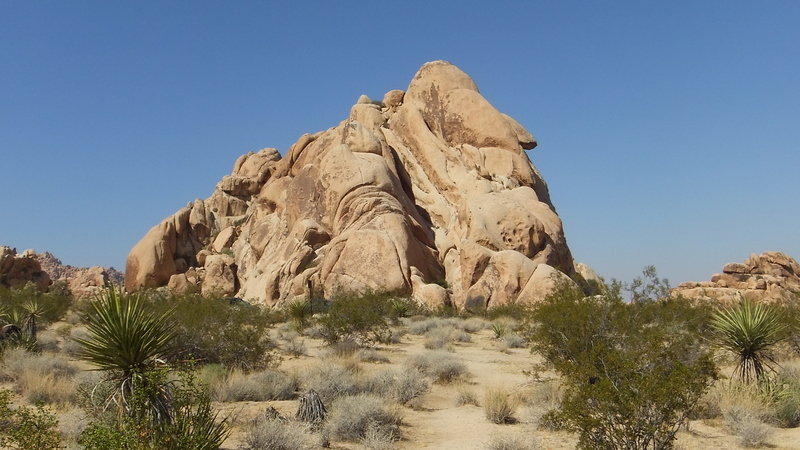 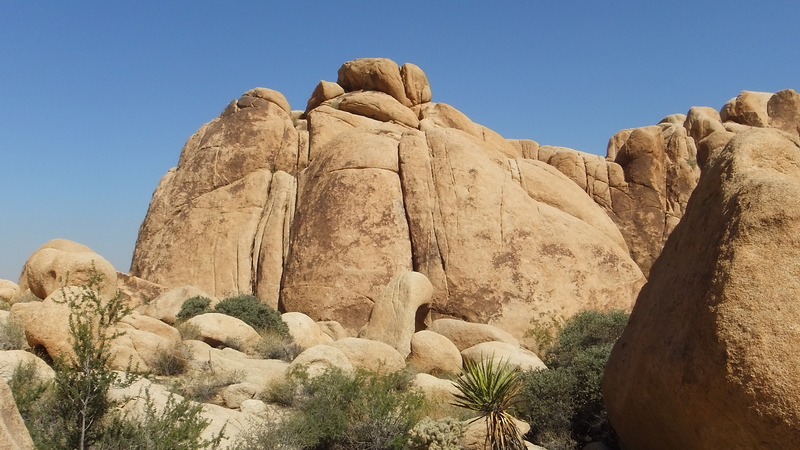 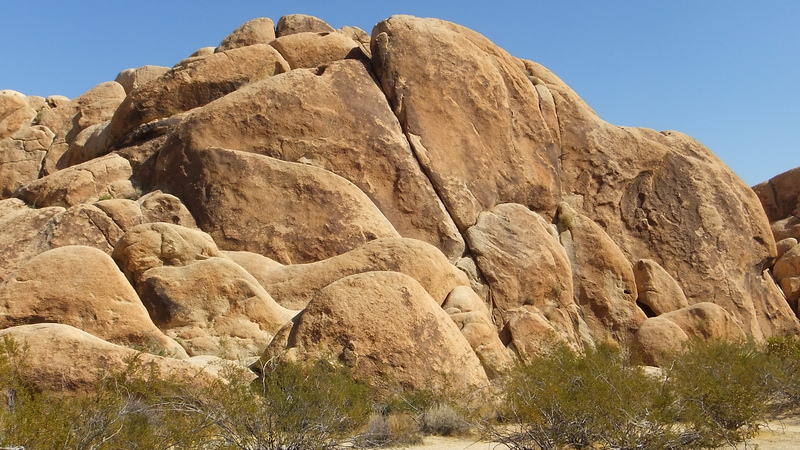 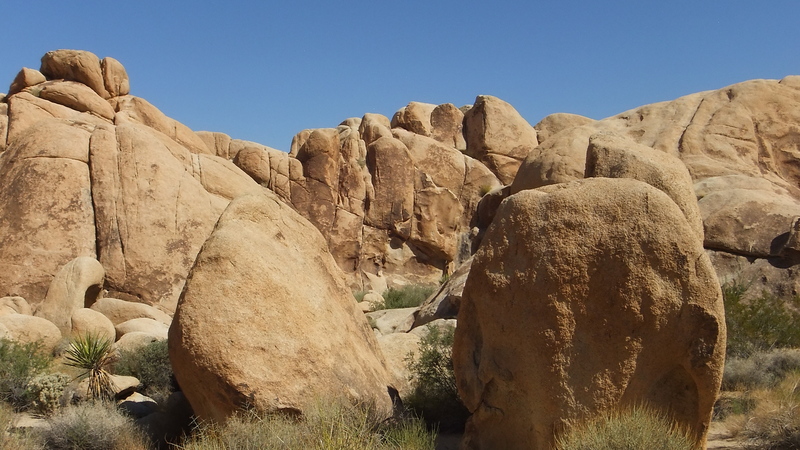 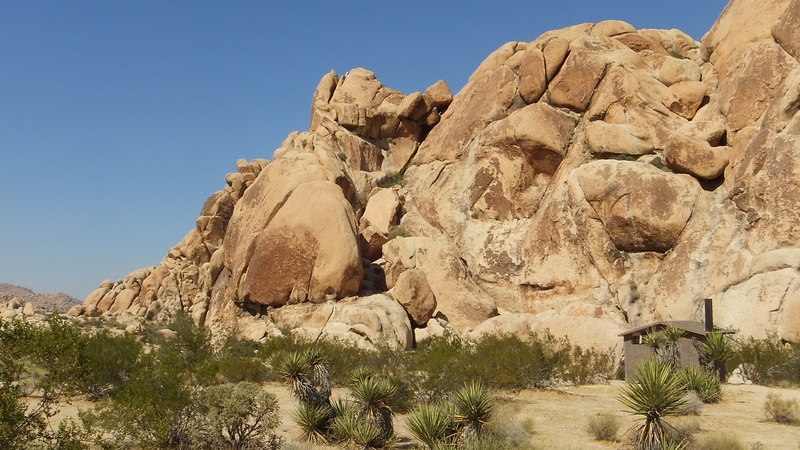 Because this area has a central location in the busy campground, casual trails crisscross everywhere leading to some of the key rock climbing features. 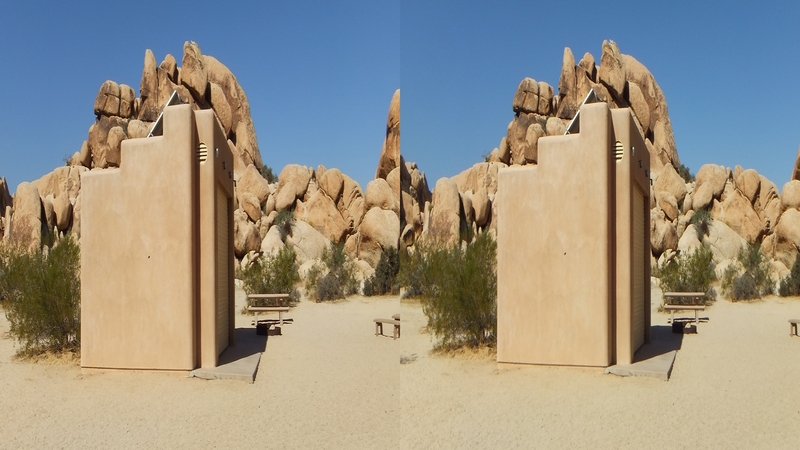 There is a convenient public parking area at the base of Campfire Crag with restroom facility nearby, and another at the camp Billboard serving Varnished Wall, Billboard Buttress, Bilbo’s Buttress, and the Center Crag formations (which will be described in the Part 2 Gallery). 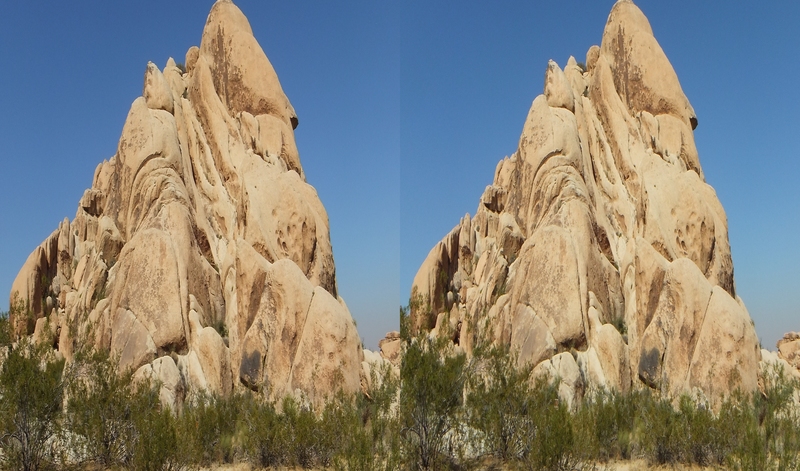 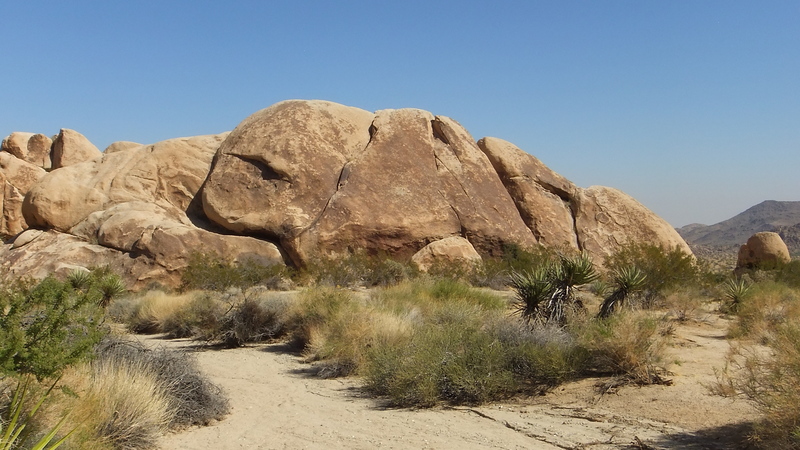 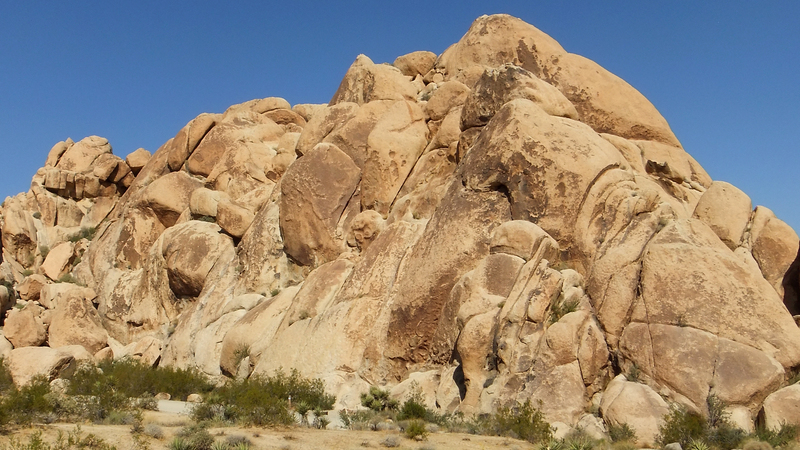 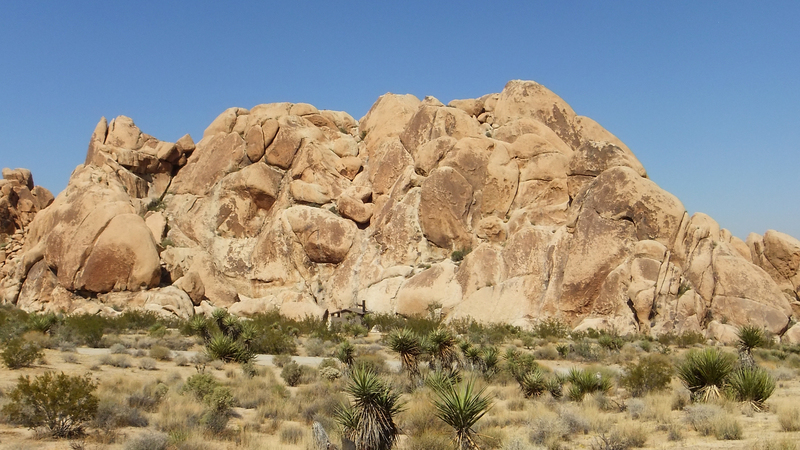 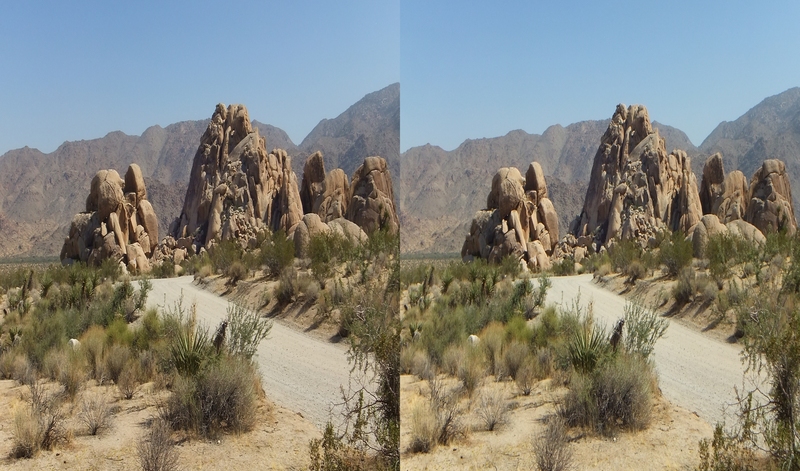 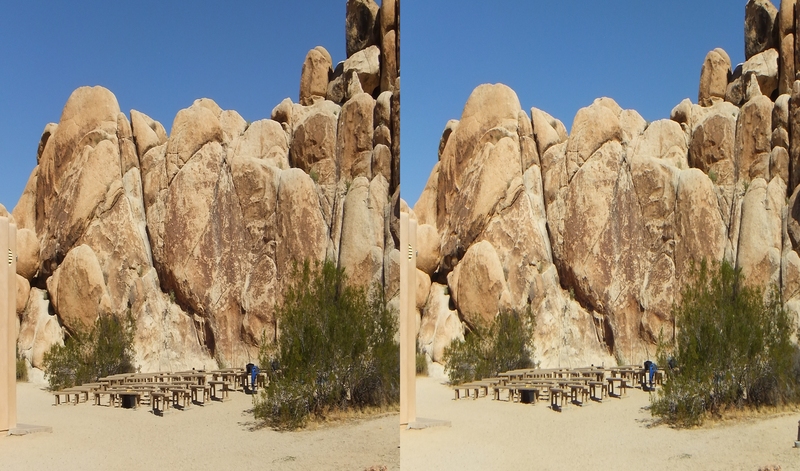 Between the two parking areas is a very popular granite rock pile known as Pixie Rock. 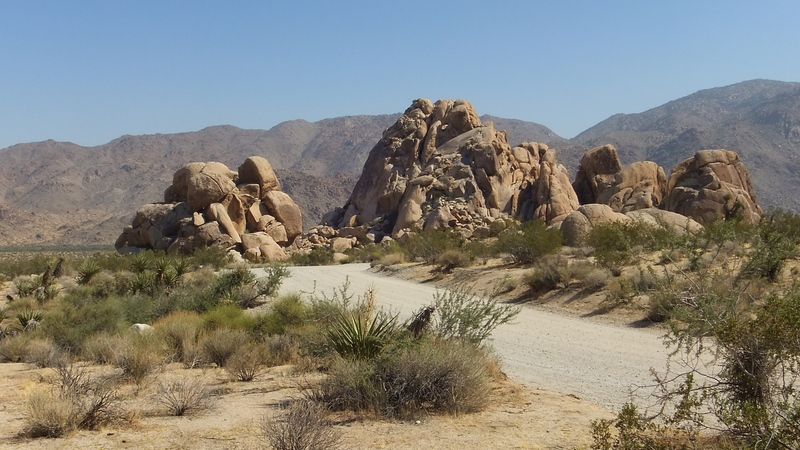 It lies just to your right (west) as you enter the campground. 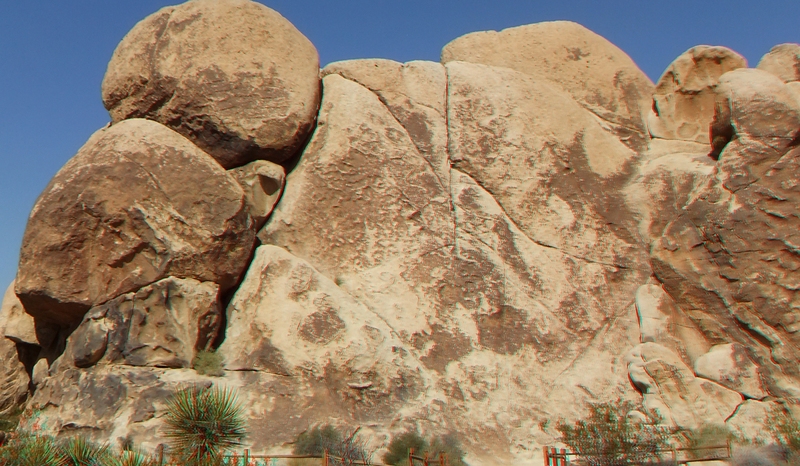 The right-hand edge of the south face is extremely steep, and has a bucketed, desert-varnish brown face. 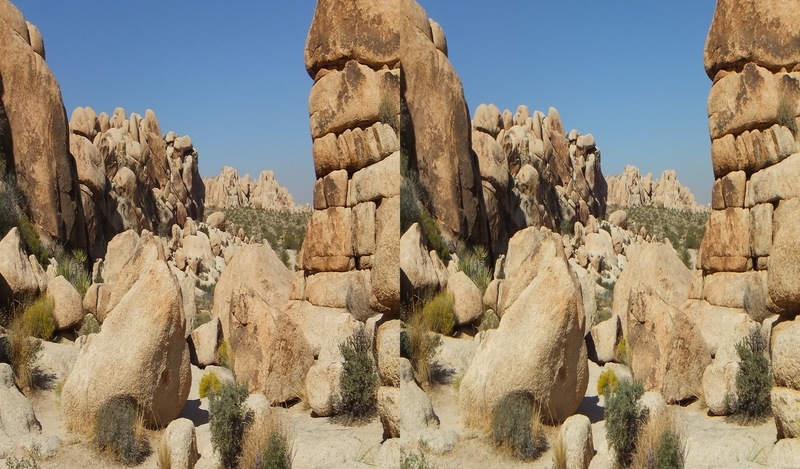 To the left is a lower-angled, lighter slab. 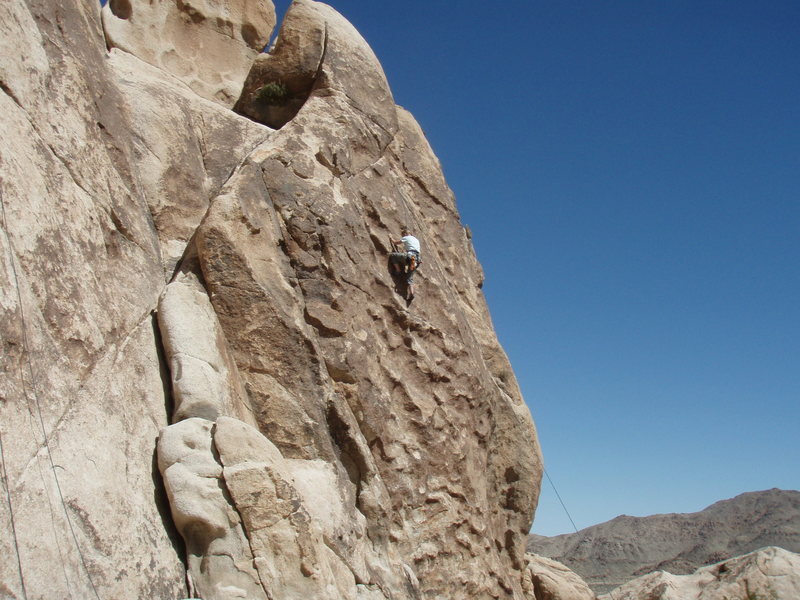 Often, you will see rock climbers and many random rock-scramblers sitting atop Pixie Rock’s elevated portions enjoying the view. 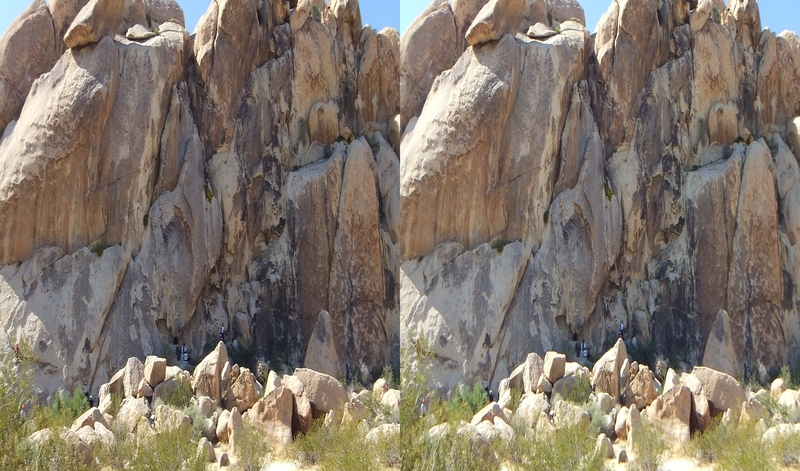 Pixie Rock, east face. 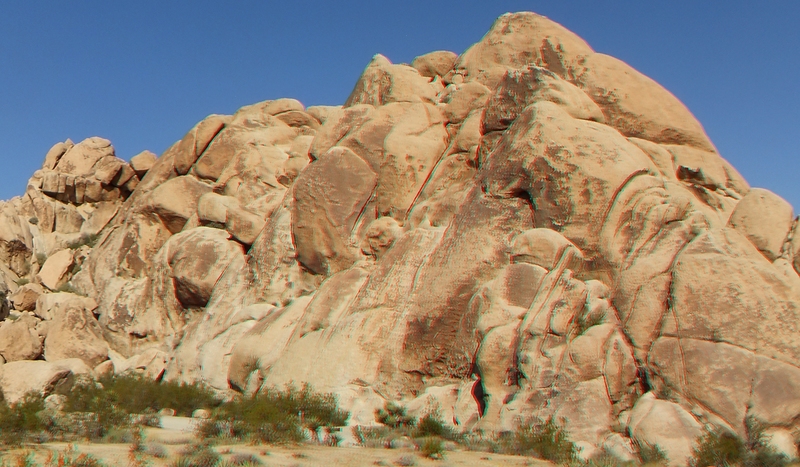 Campfire Crag at far right. 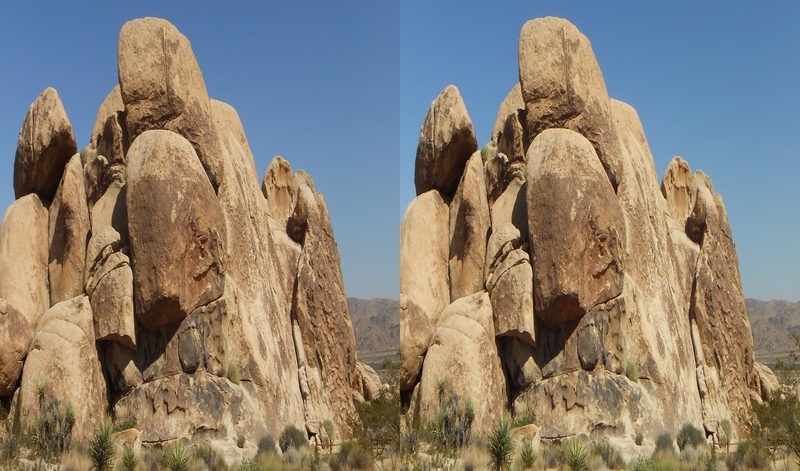 At the left end (though facing south by southwest) is a wall that juts out from the main formation. 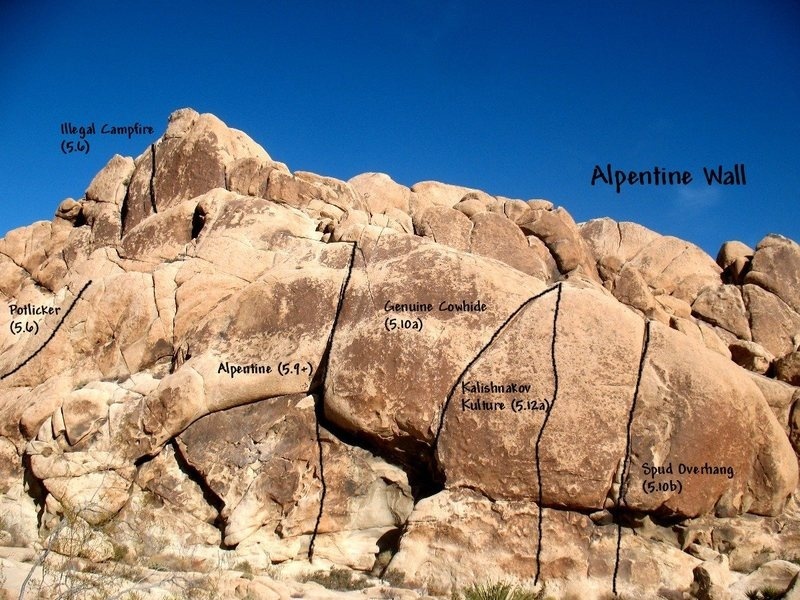 The climbers name this Alpentine Wall (see next section). 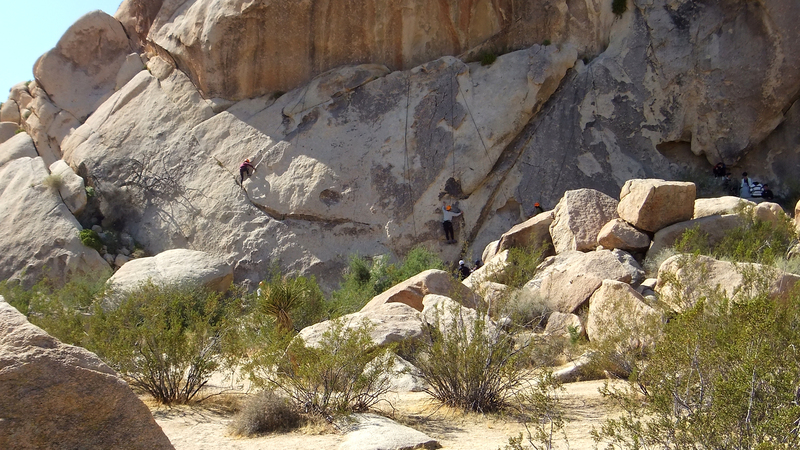 Seven climbing routes are recorded on this portion of Campfire Crag, including the lower wall and upper point. 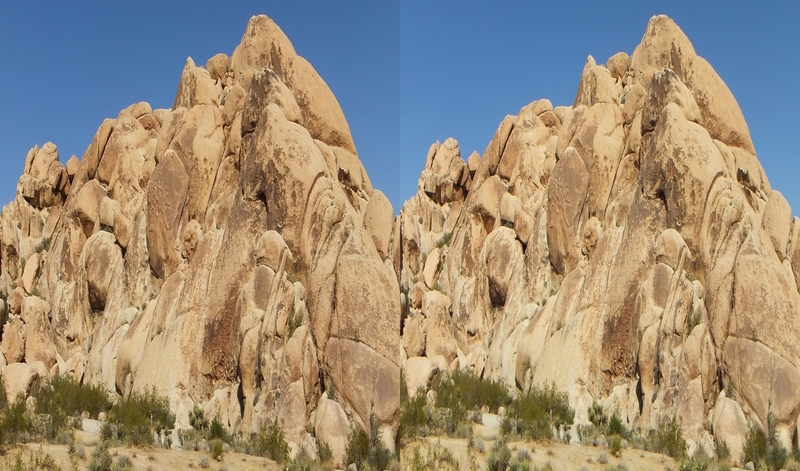 “Slightly left of the main south face of Campfire Crag and jutting out a bit more is this wall that although technically connected feels like a separate crag. 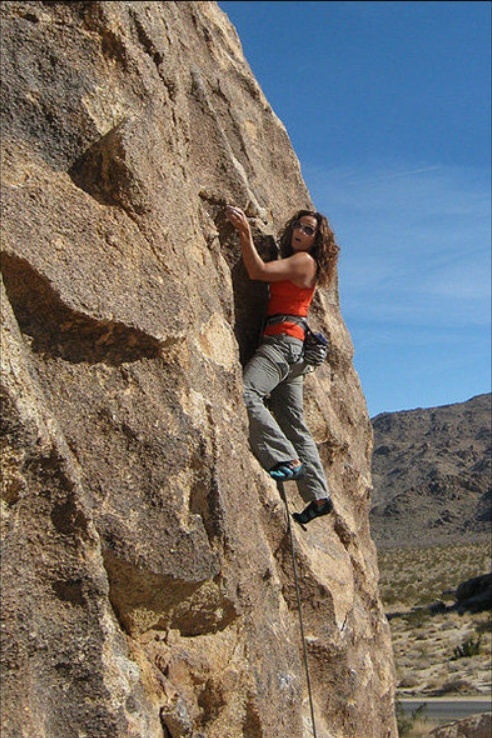 The bulk of the climbs here are moderate cracks with challenging protection although one difficult face route exists here as well.”—Mountain Project. 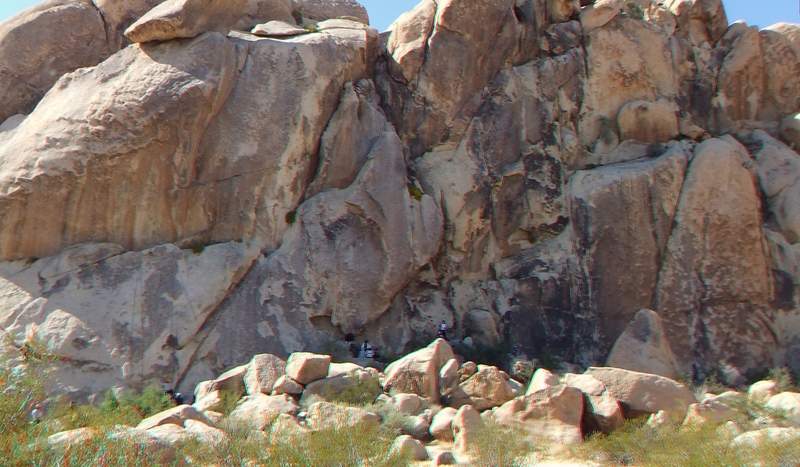 Follow the trail from the parking lot toward the amphitheater area, the north face will be on your left. 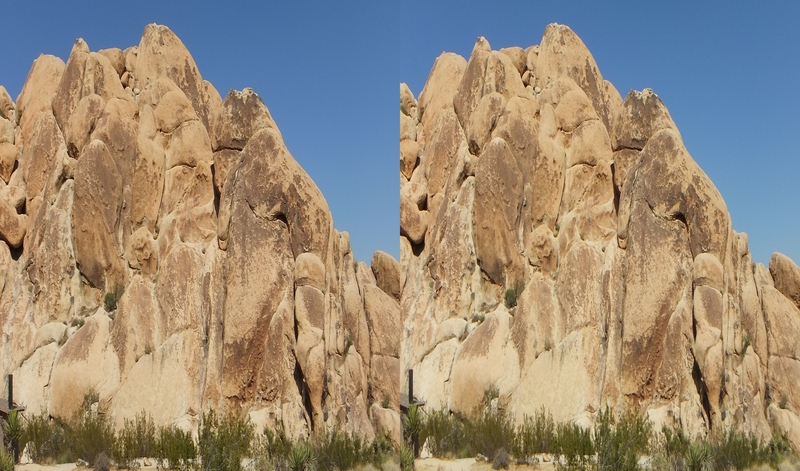 Several short cracks and faces lie below and right of this side. 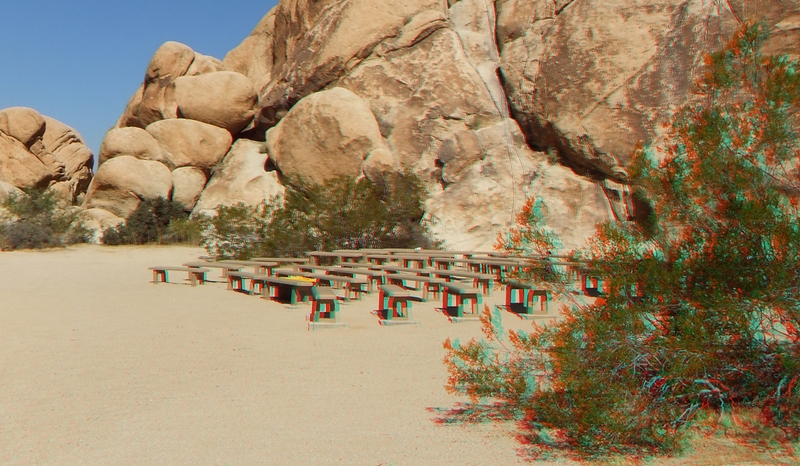 Gets lots of shade. 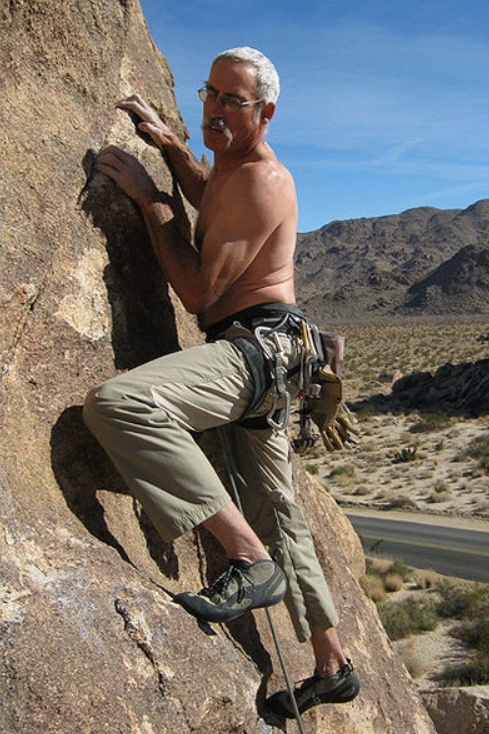 Mountain Project lists 10 routes on the north face, some of them creatively named. 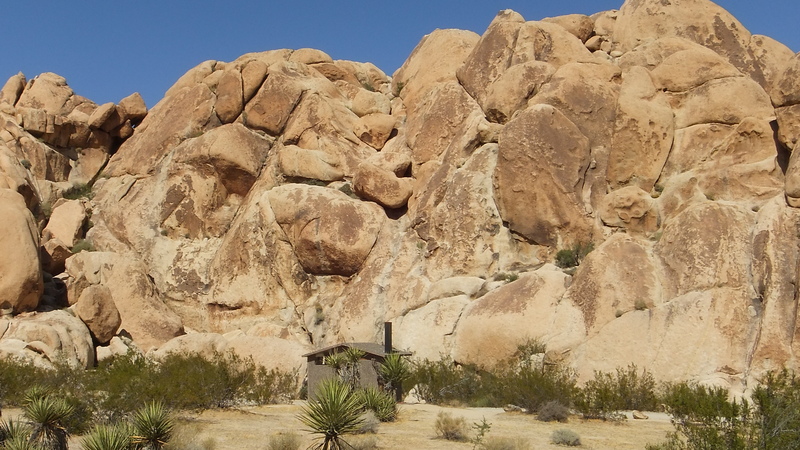 We have “Omega,” “I Had a Dream,” “Klingon Pizza,” “Bonfire,” “Fat Man’s Misery,” “Nickel Slots,” “Ostrich Skin,” “Awful Loose,” “Presupposition,” “Prejudicial Viewpoint,” “Campfire Girl,” “Crumble Cake,” “O’Bulg”—well, you get the idea. 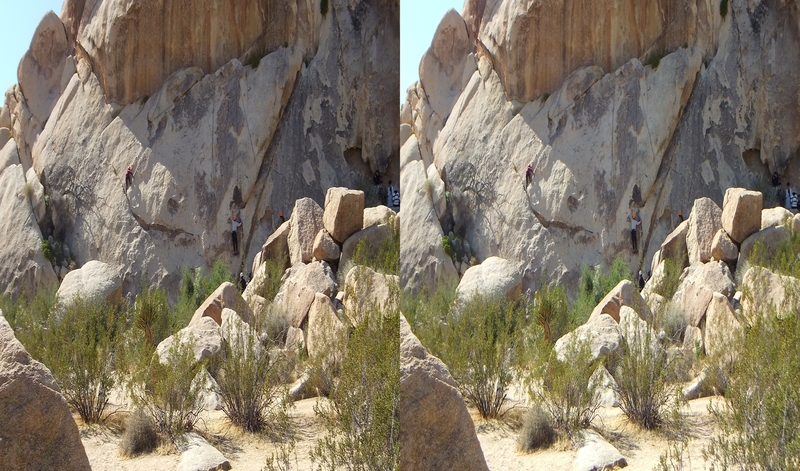 The day I took these photos, a group of about 15 young Japanese amateur climbers were all over this north wall, and some had even drifted onto the Circle Crag area by the amphitheater, with climbing ropes hung and primed for activity. 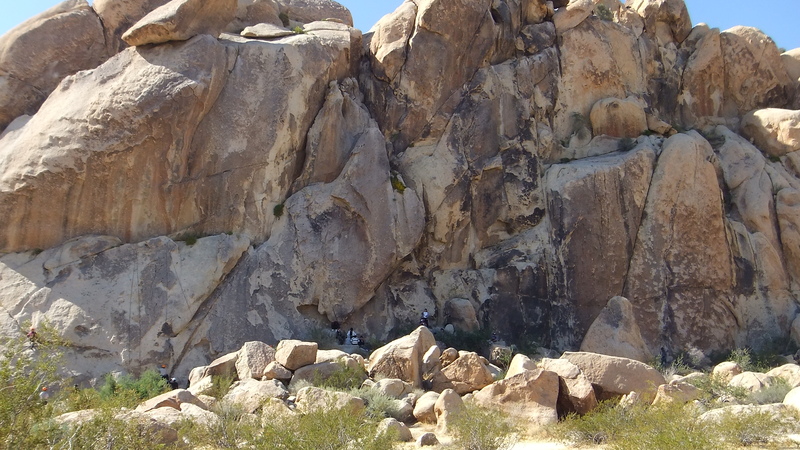 This low wall lies directly behind the amphitheater seating area, about 100 yards north of Campfire Crag. 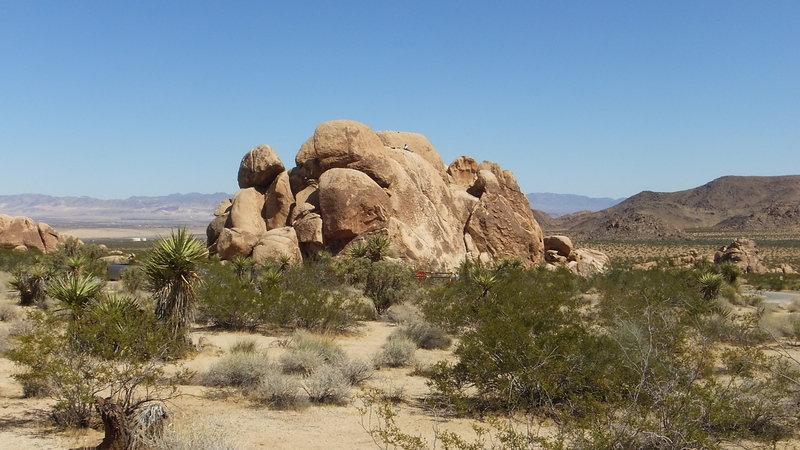 It is the left extension of Jaime’s Rock, and on the opposite side of the rocks from Group Campsite #1. 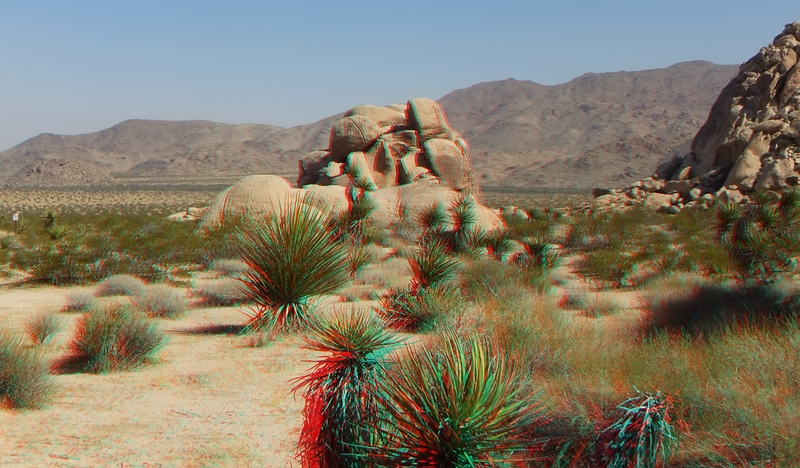 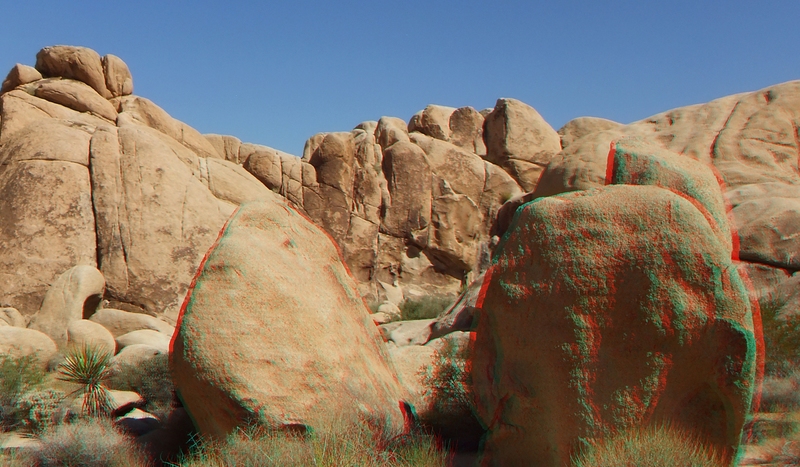 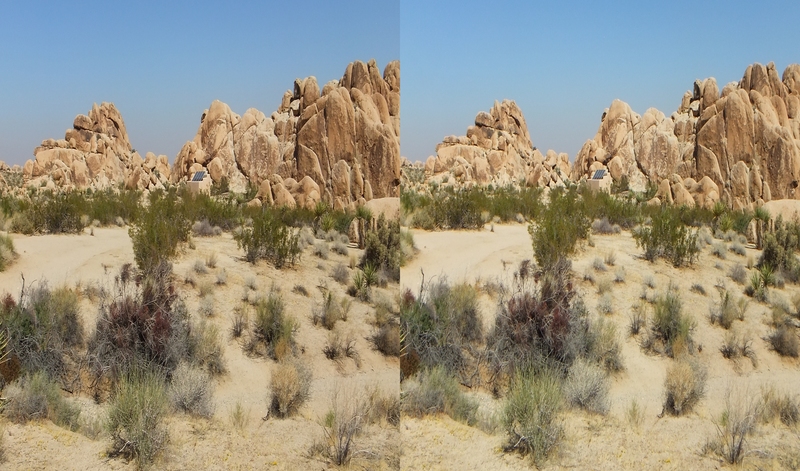 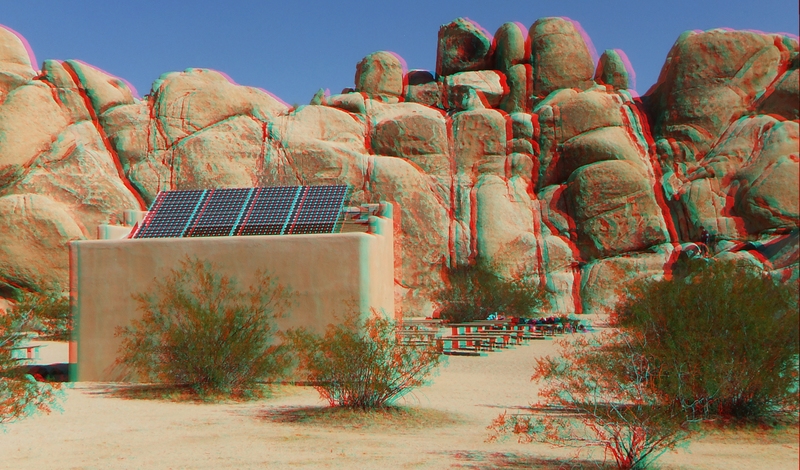 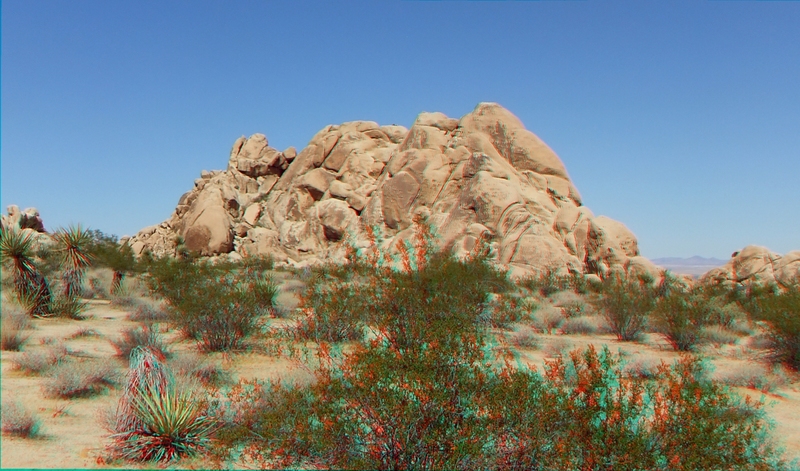 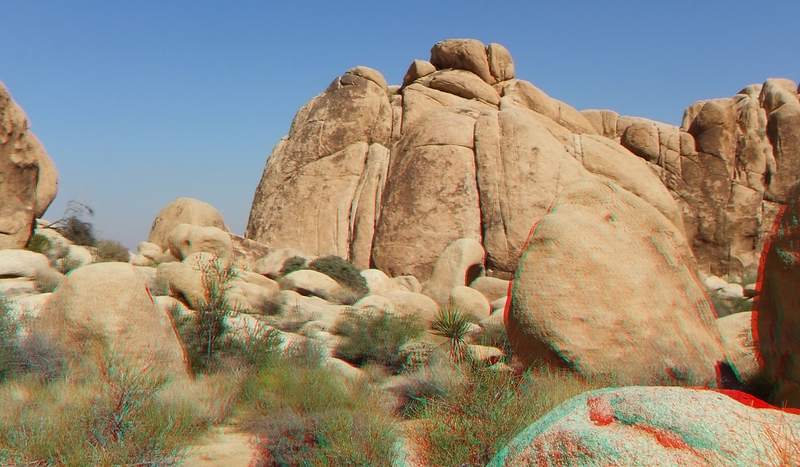 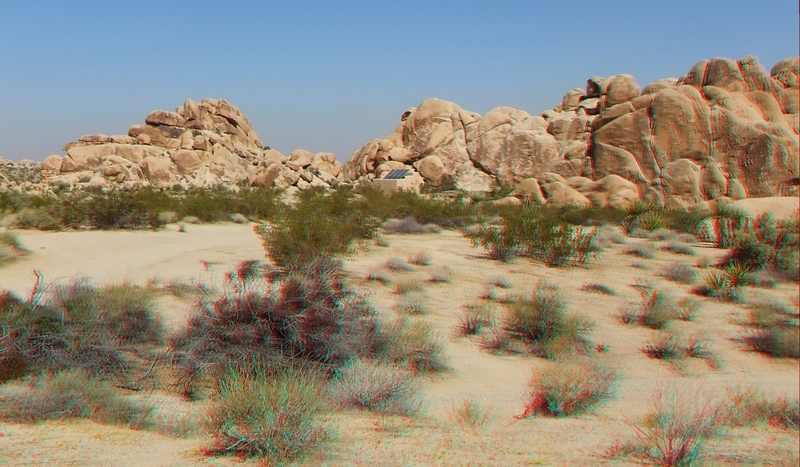 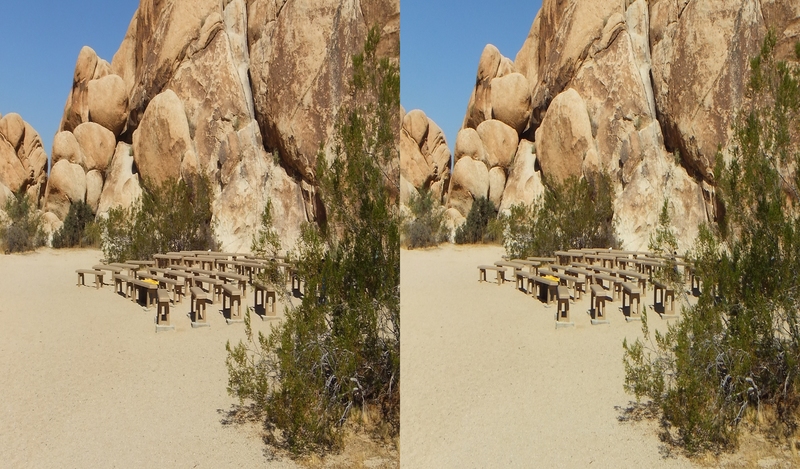 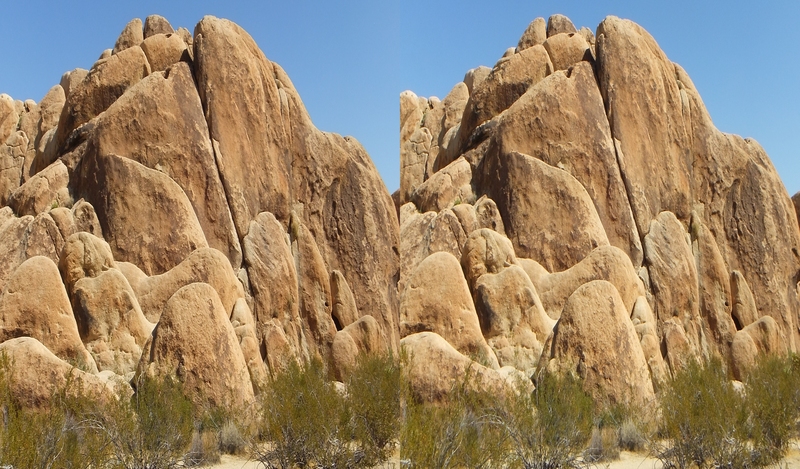 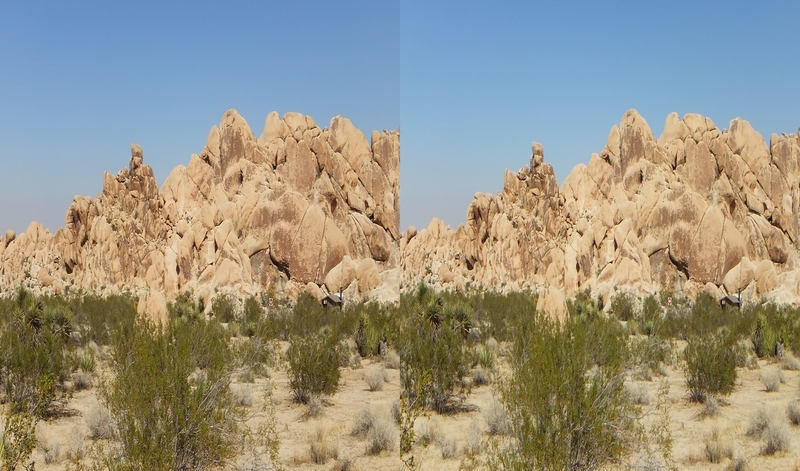 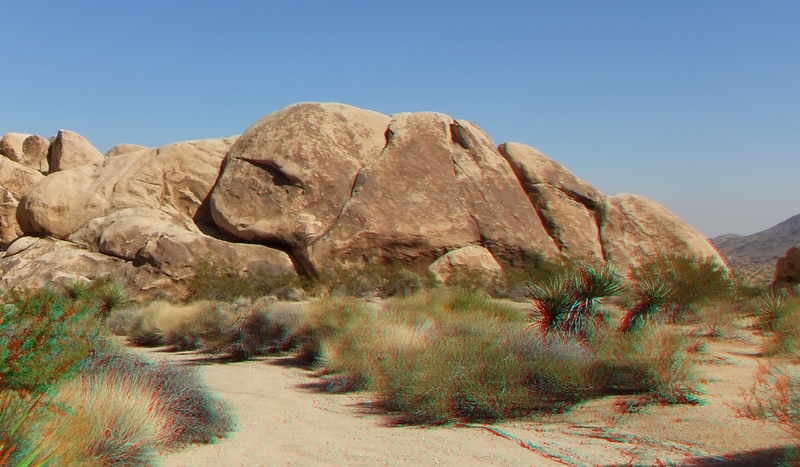 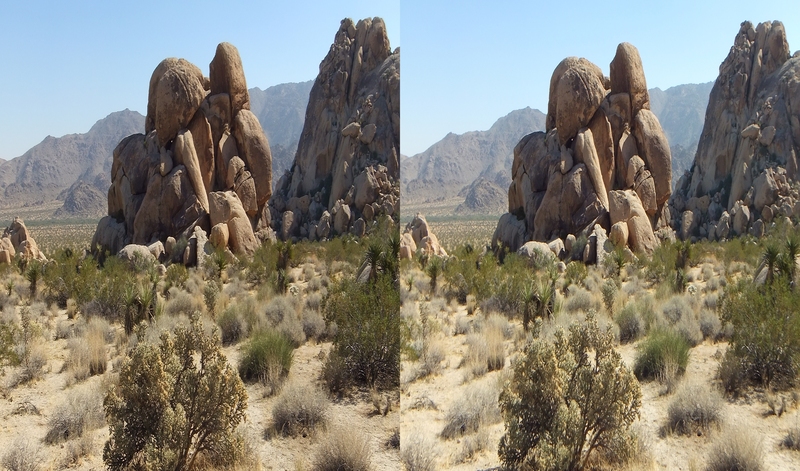 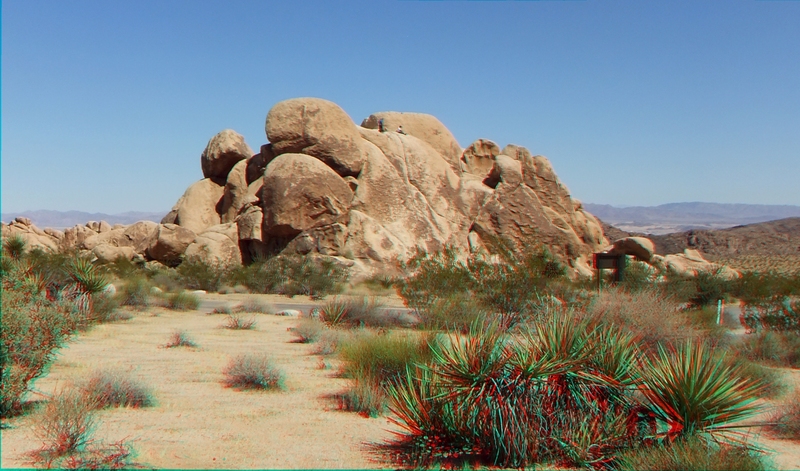 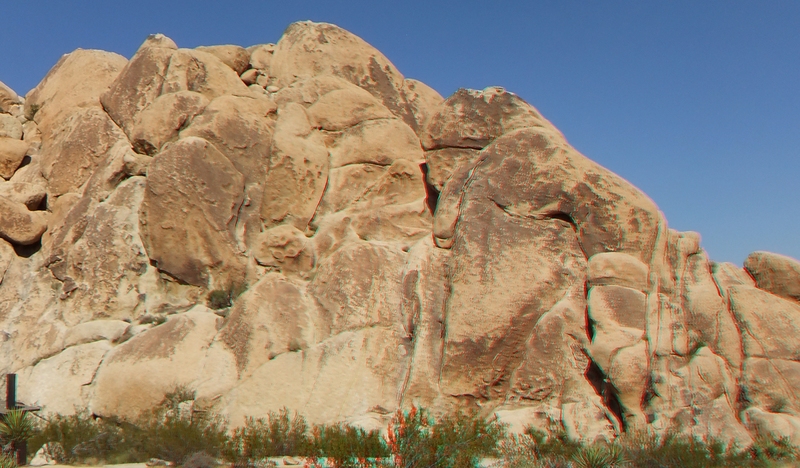 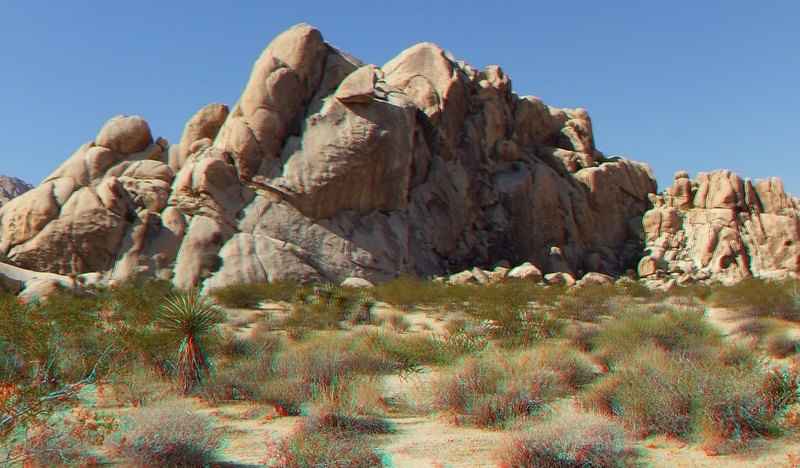 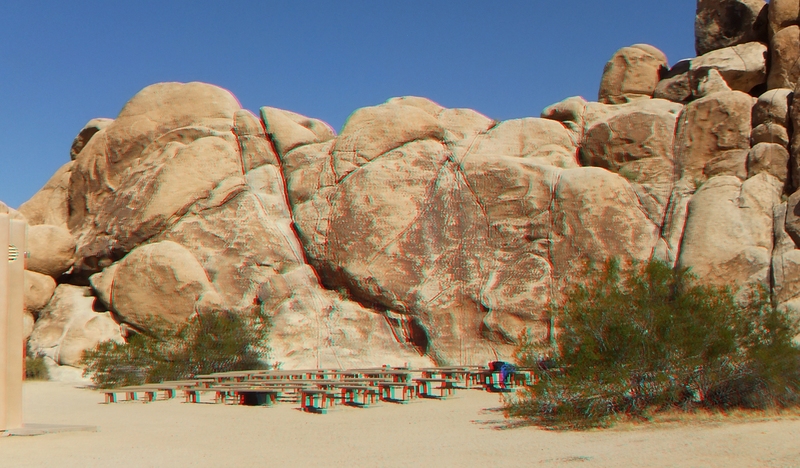 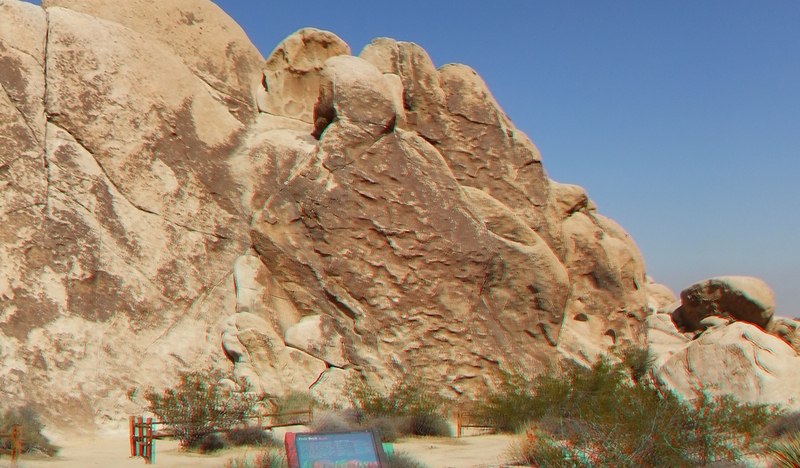 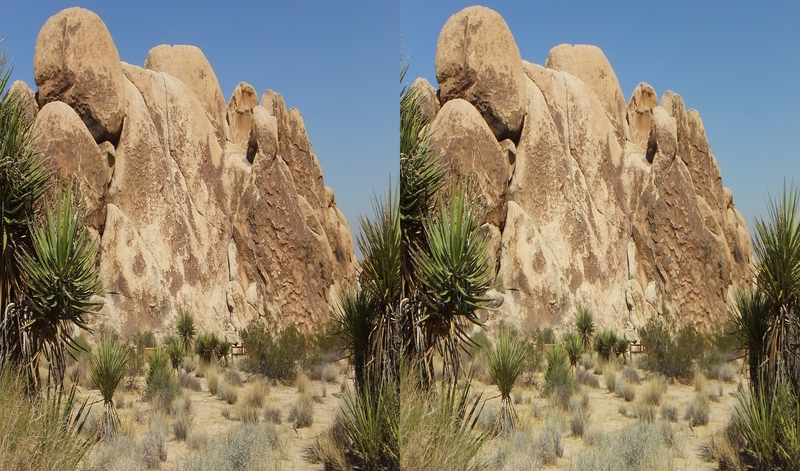 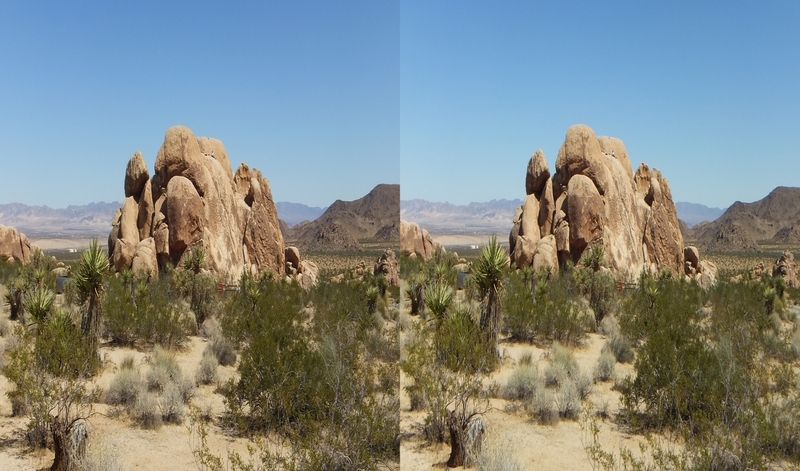 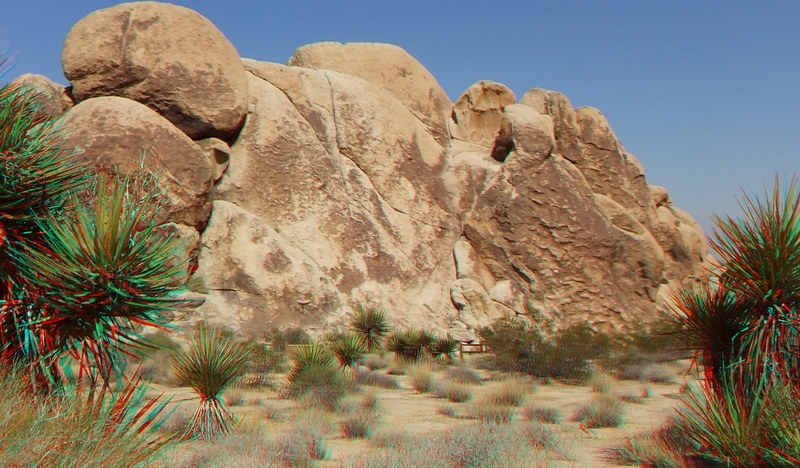 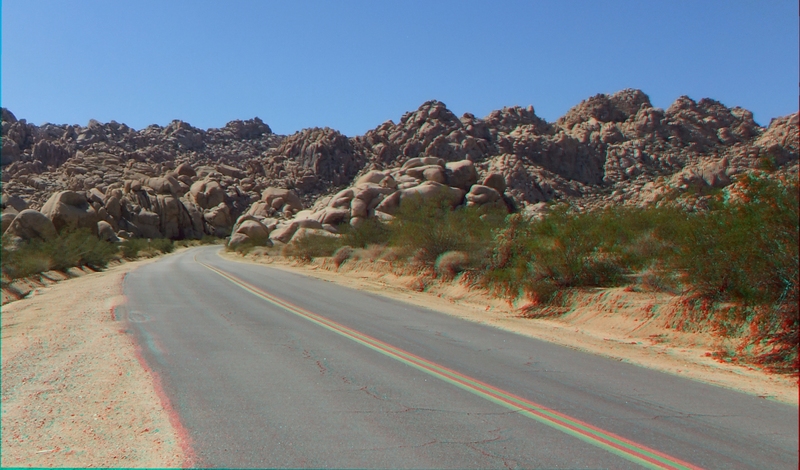 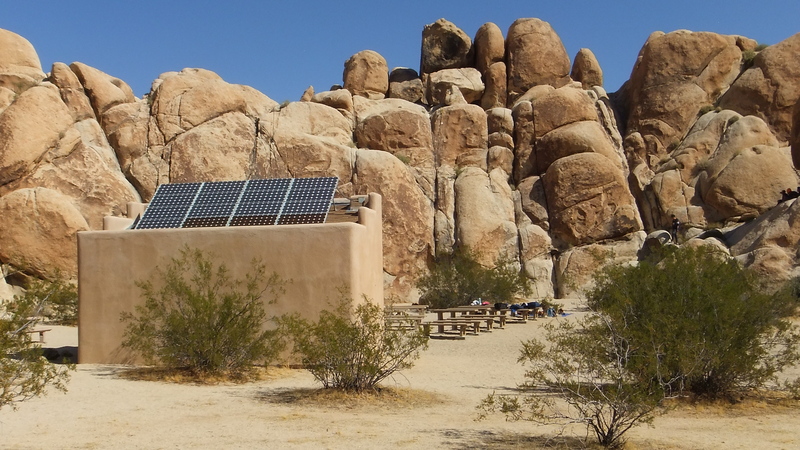 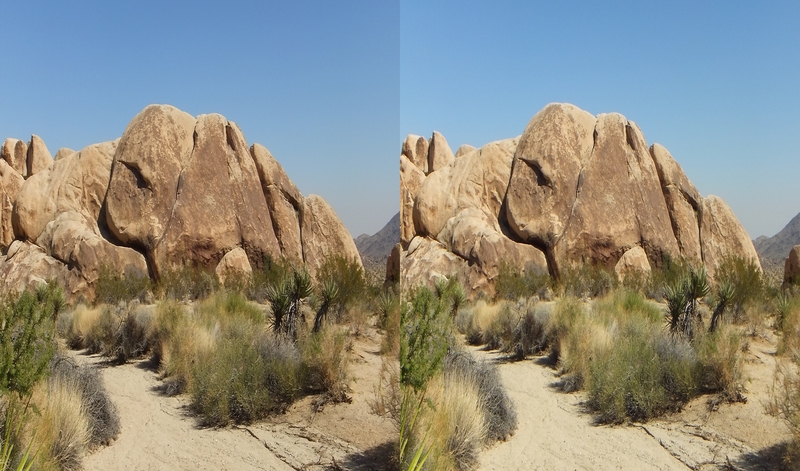 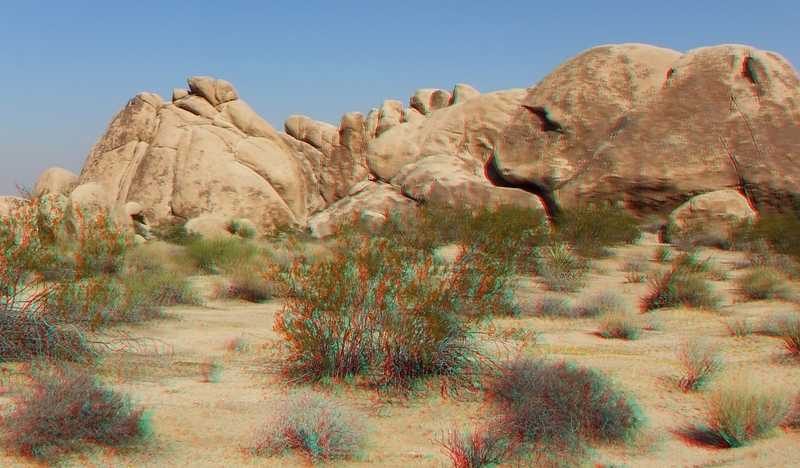 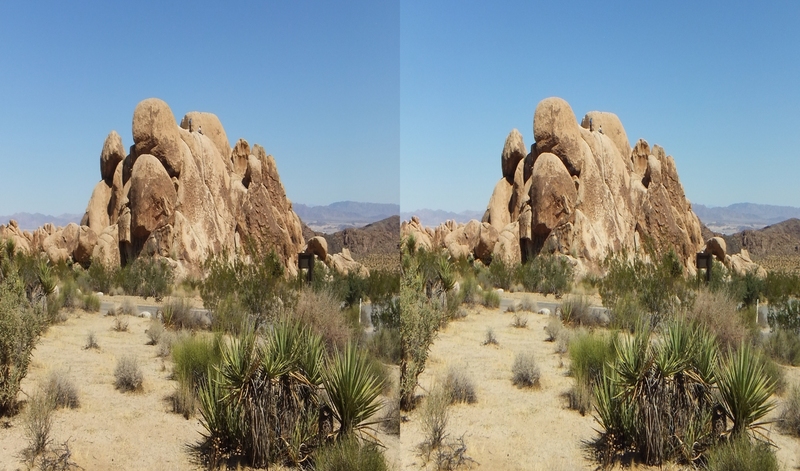 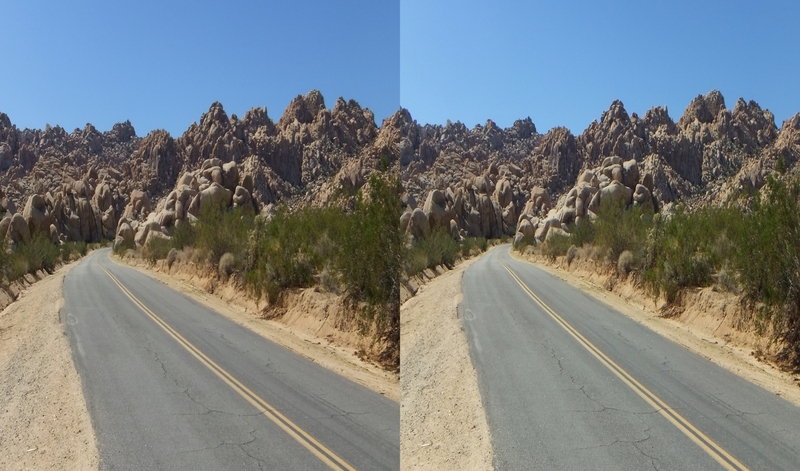 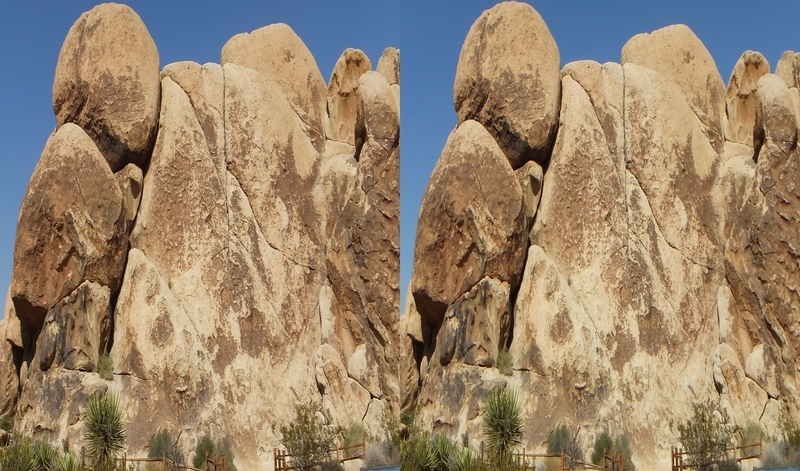 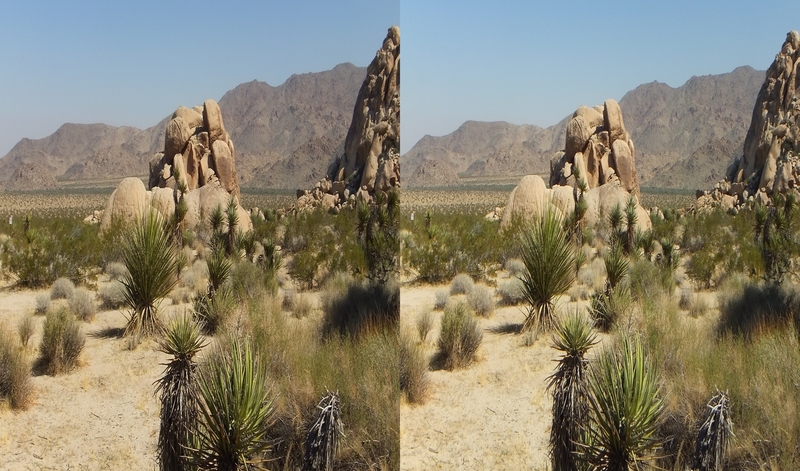 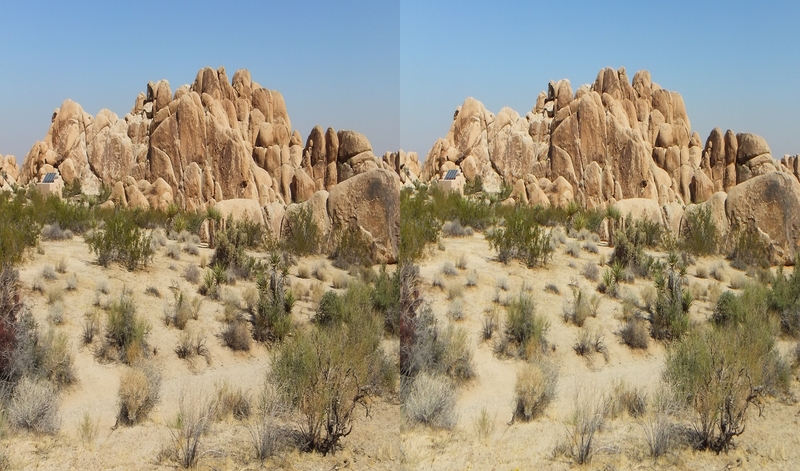 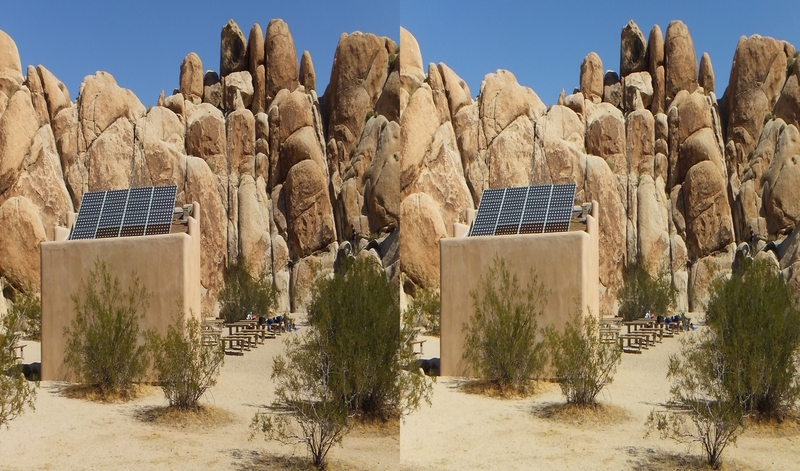 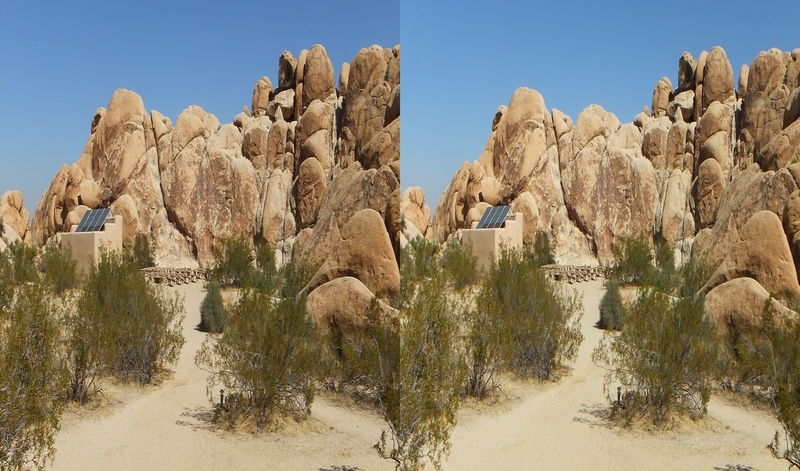 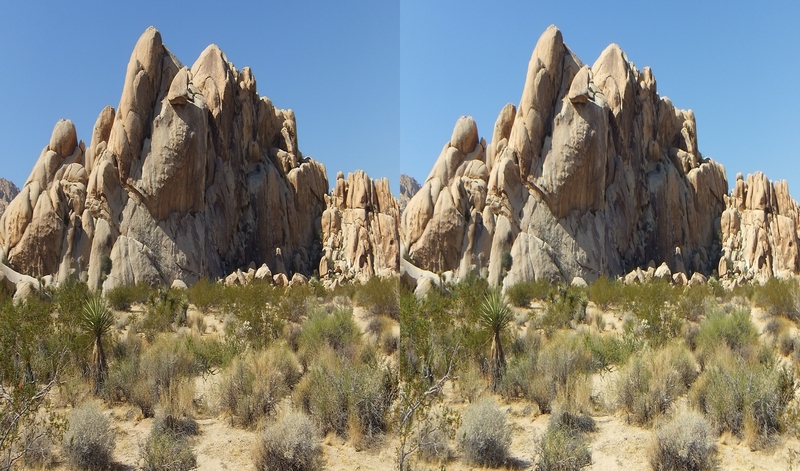 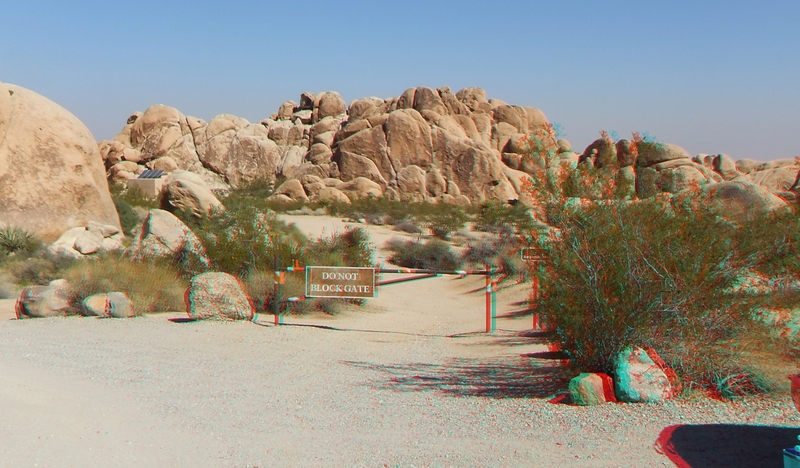 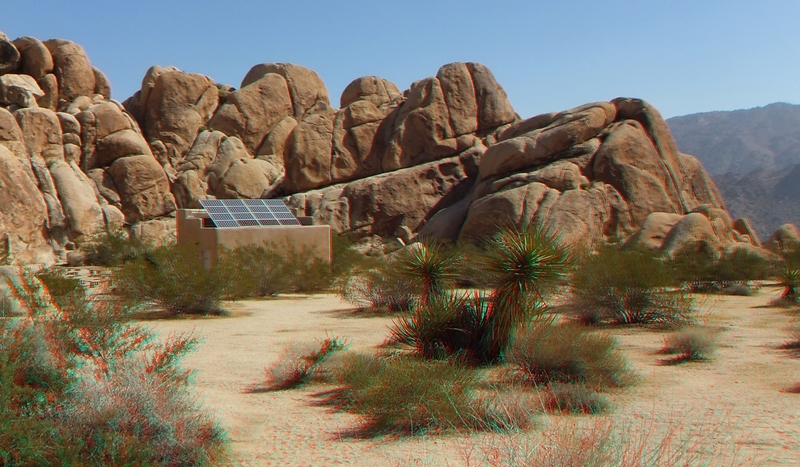 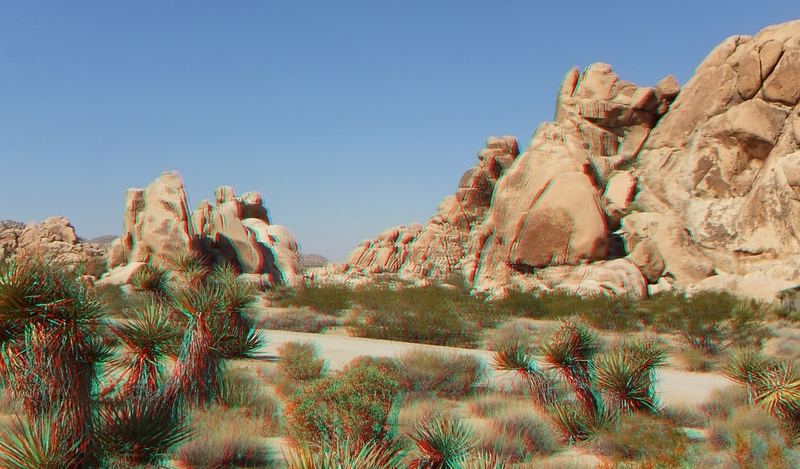 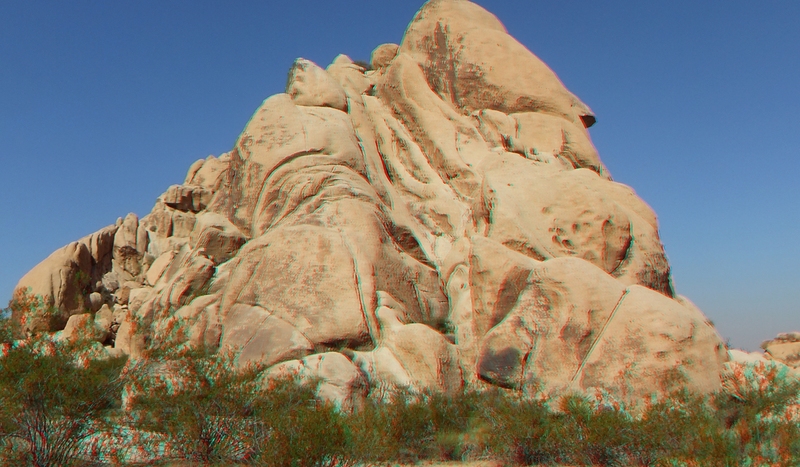 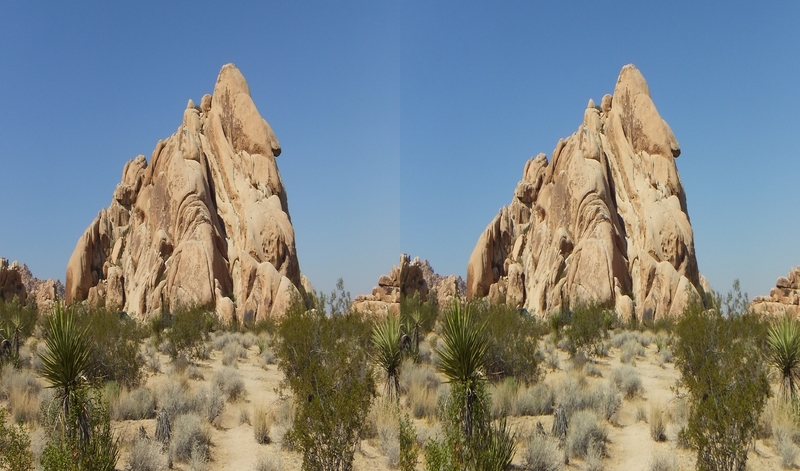 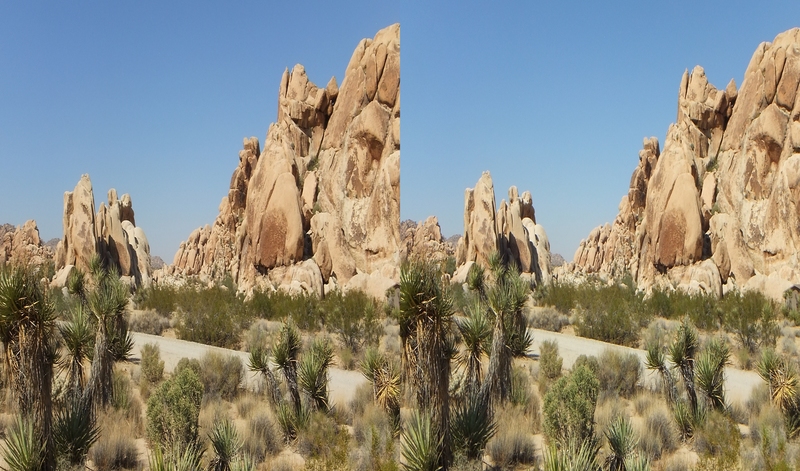 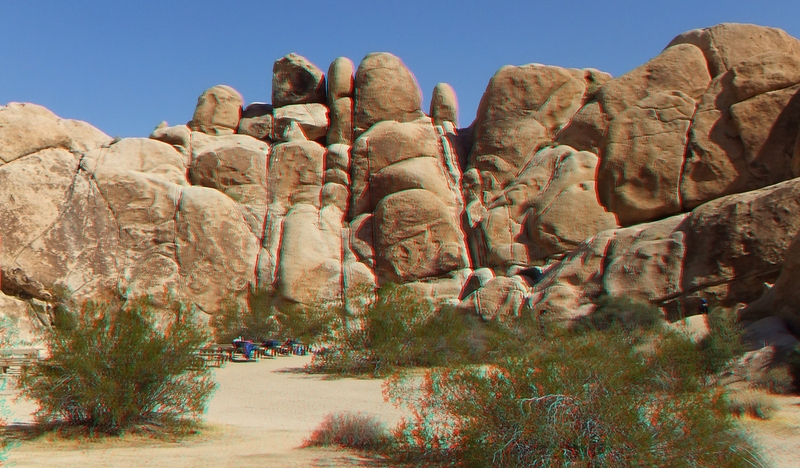 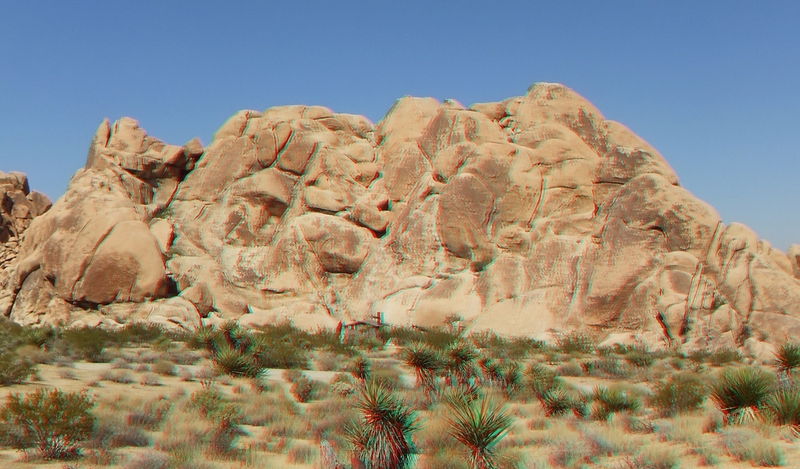 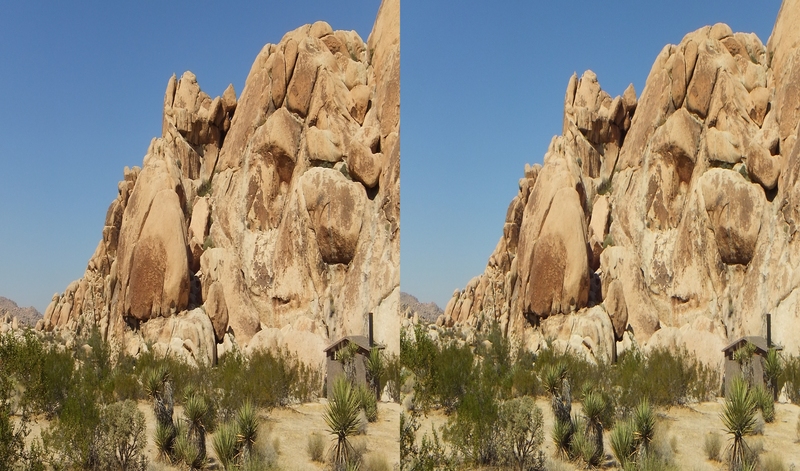 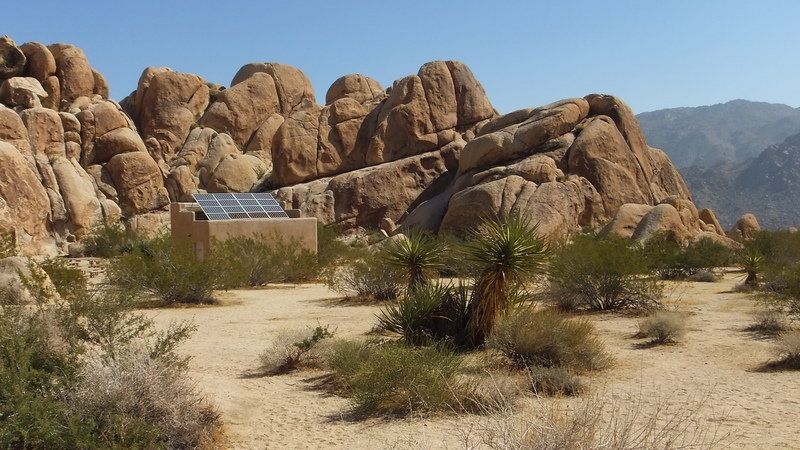 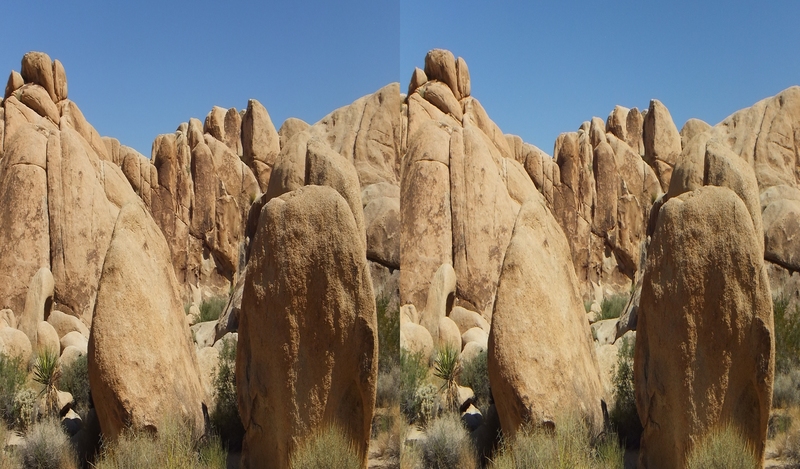 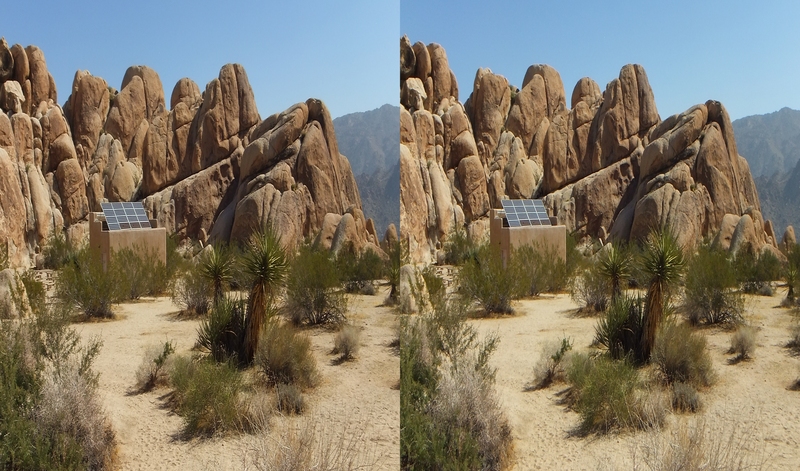 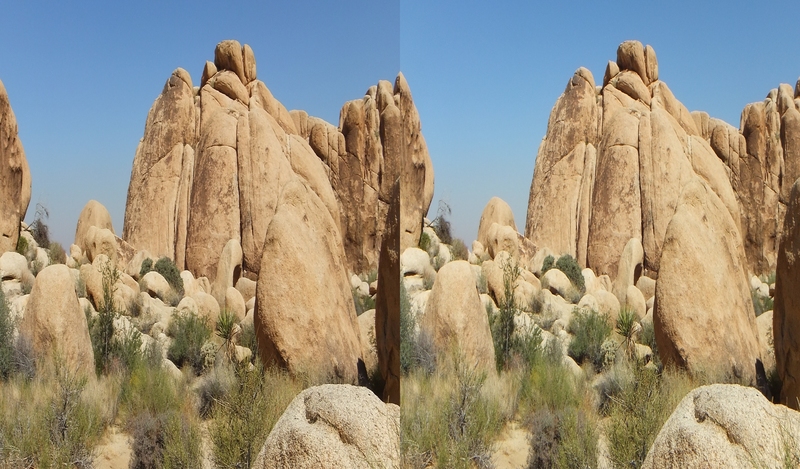 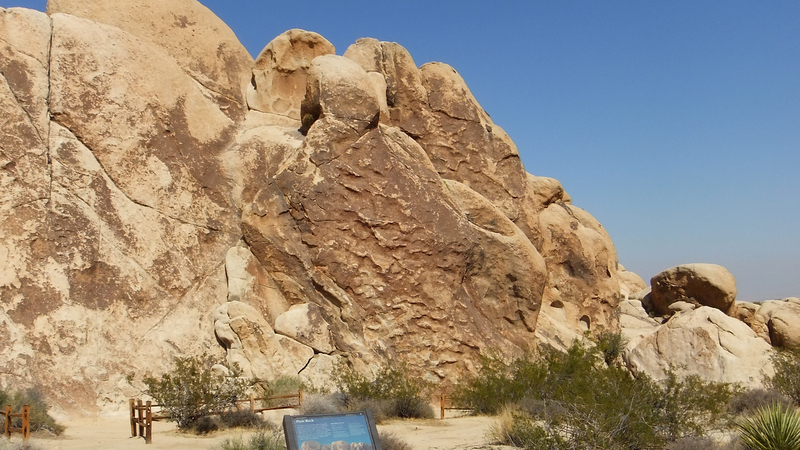 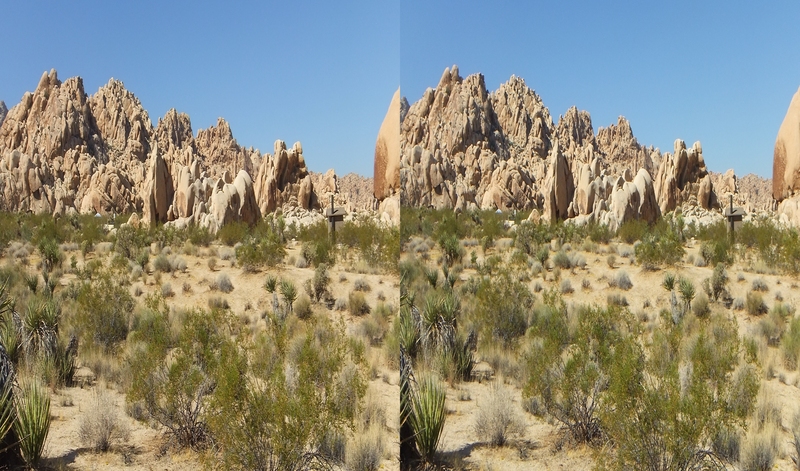 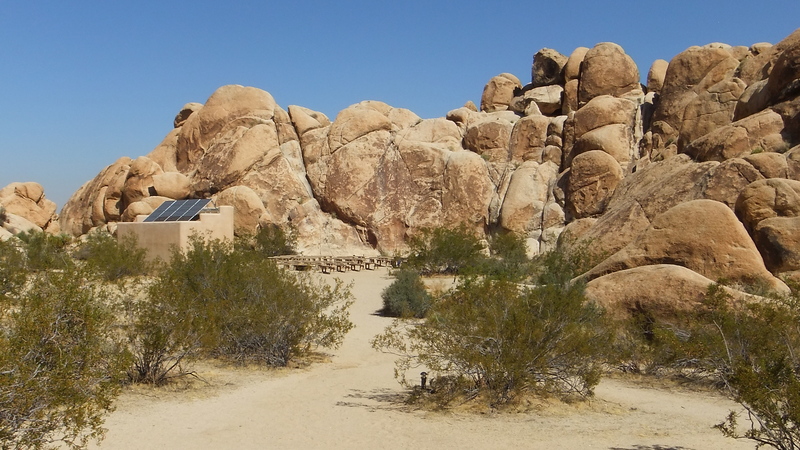 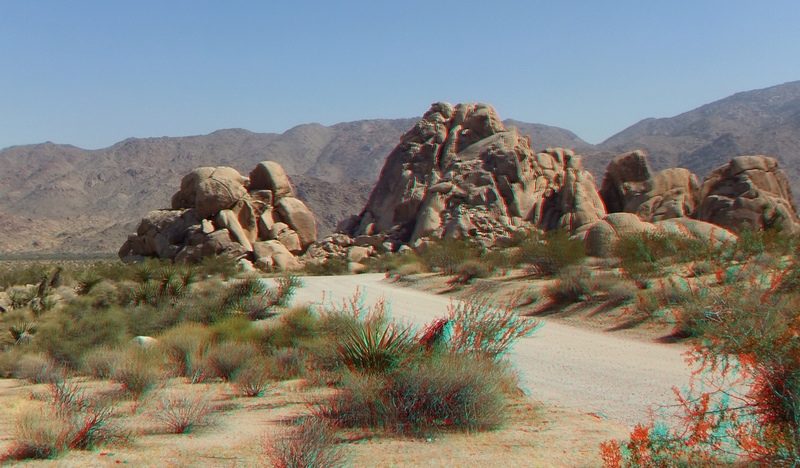 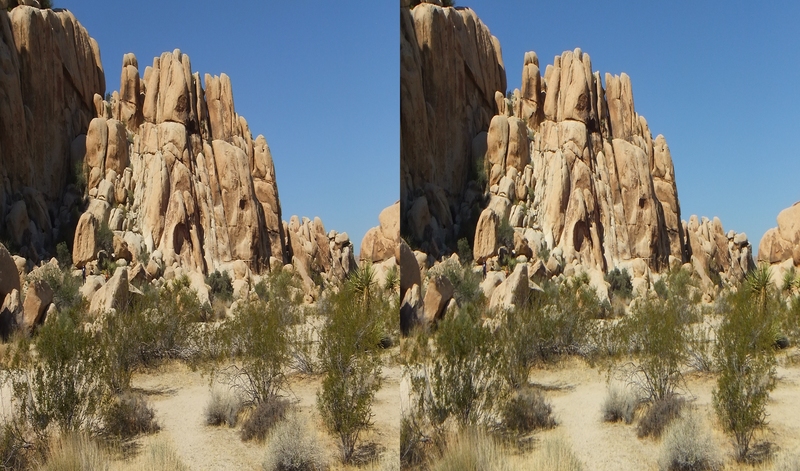 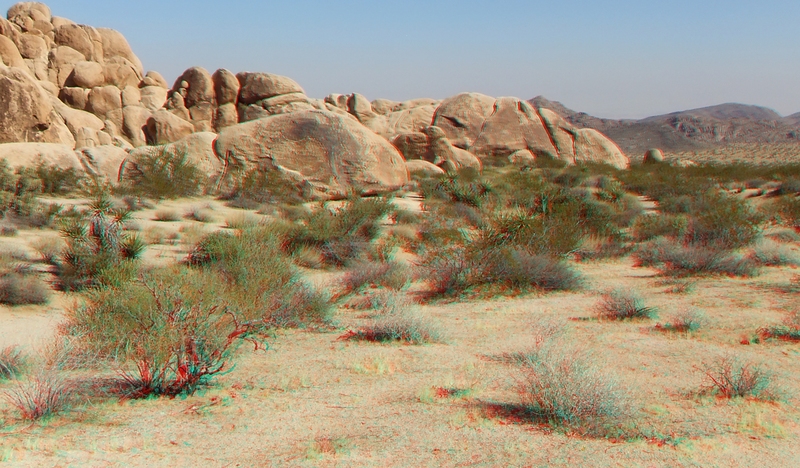 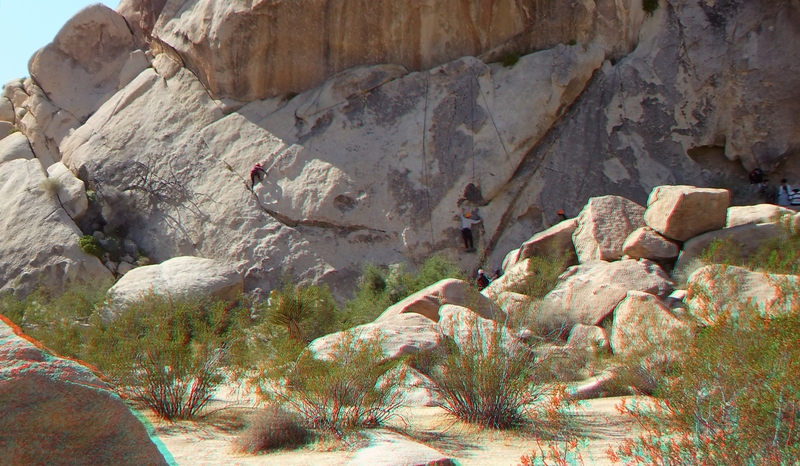 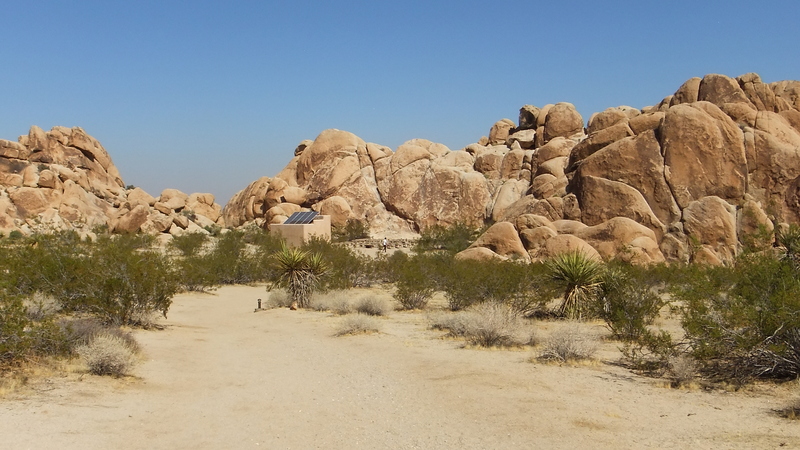 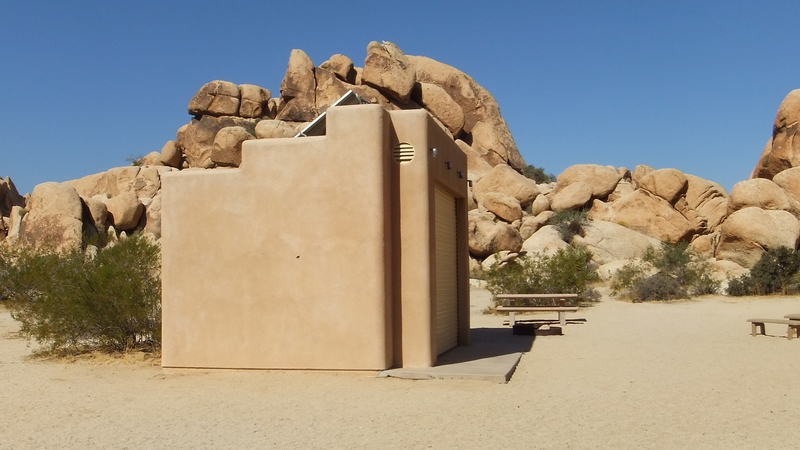 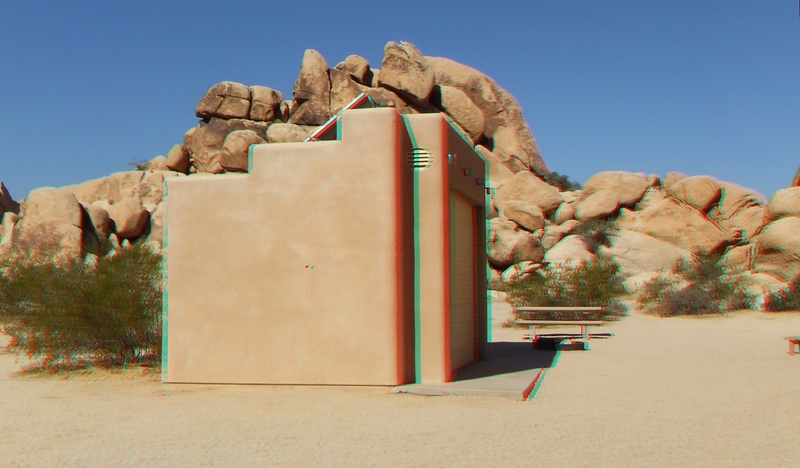 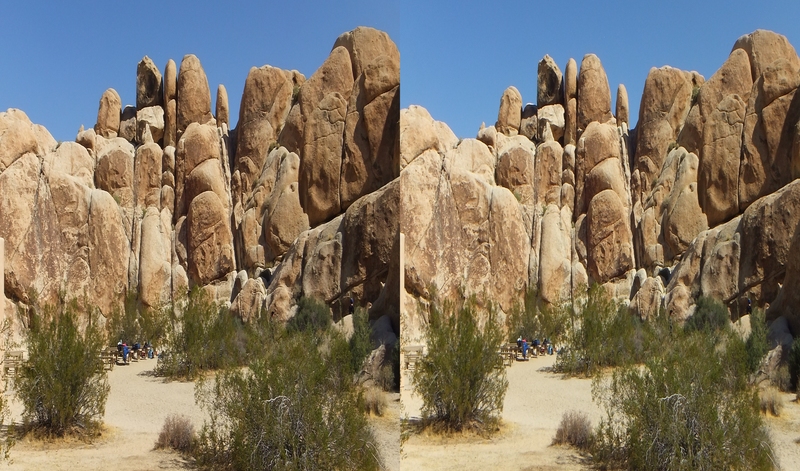 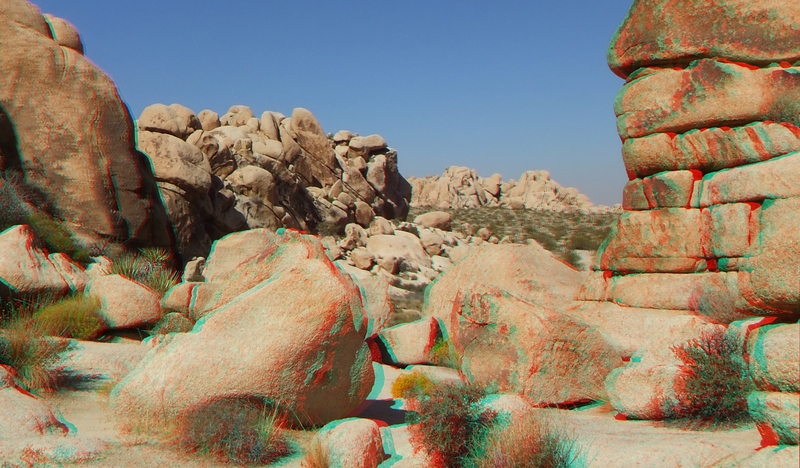 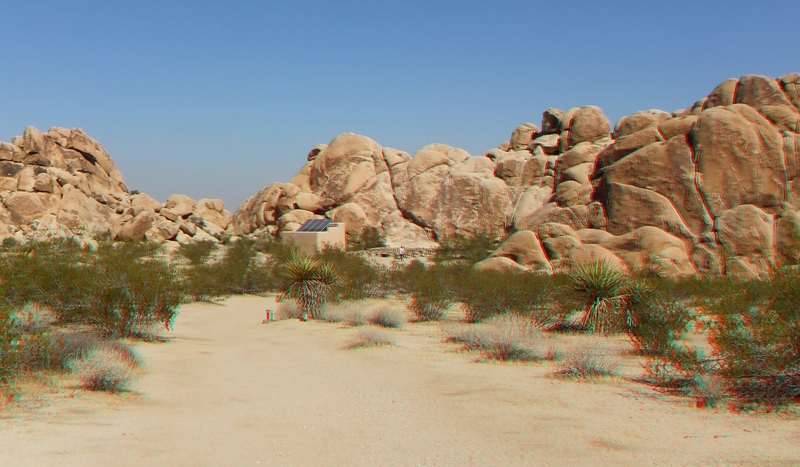 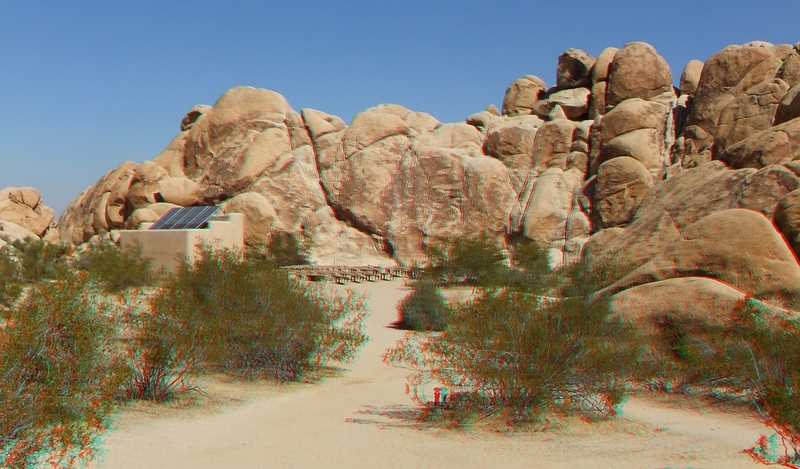 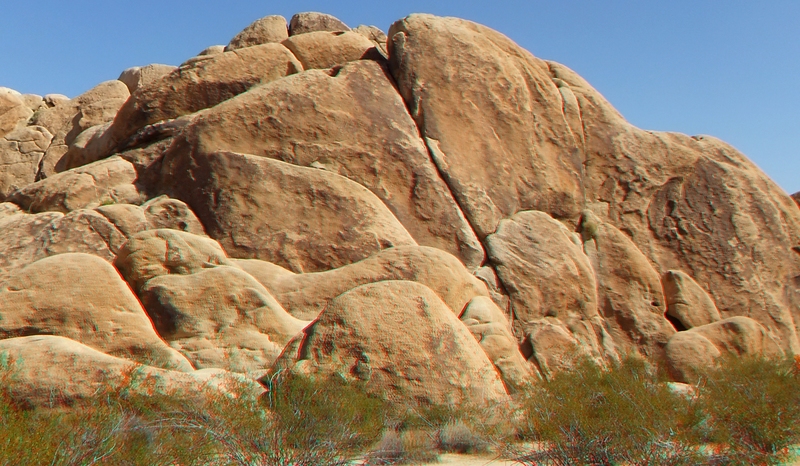 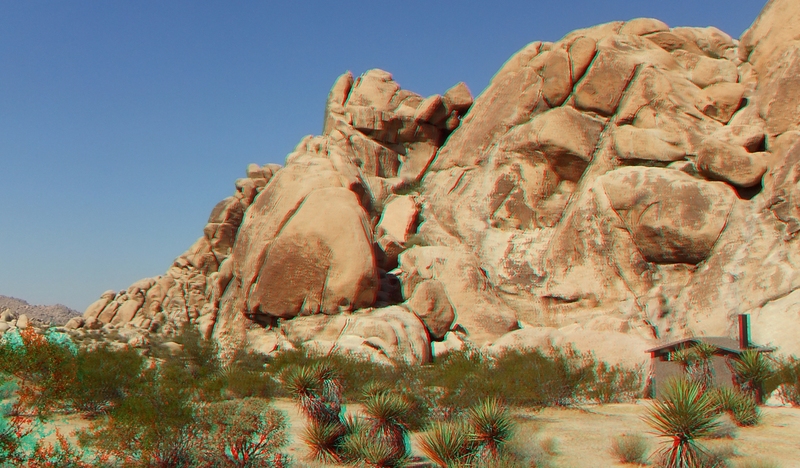 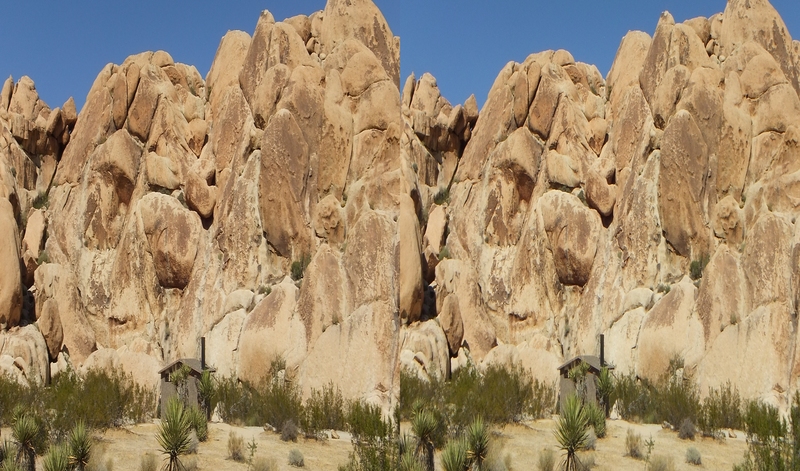 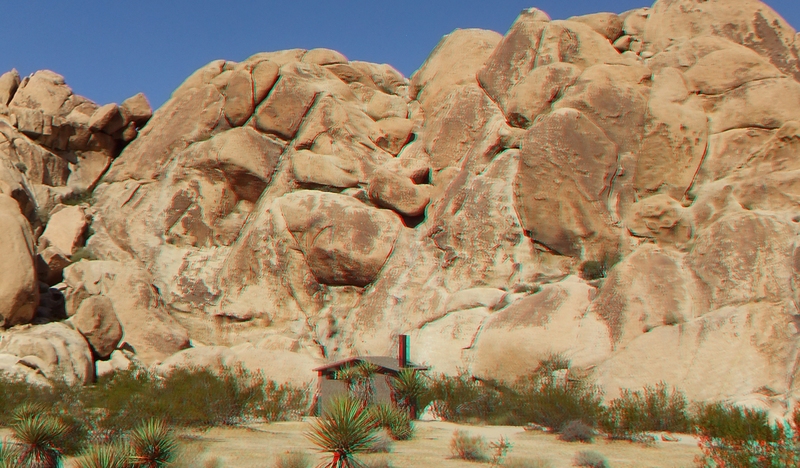 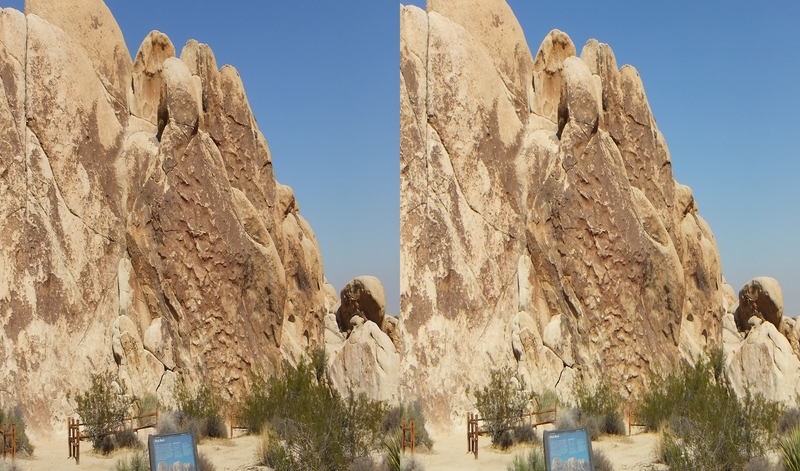 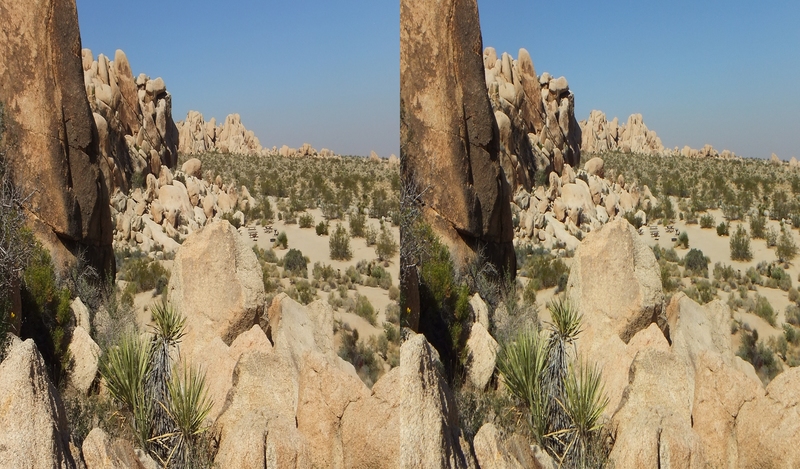 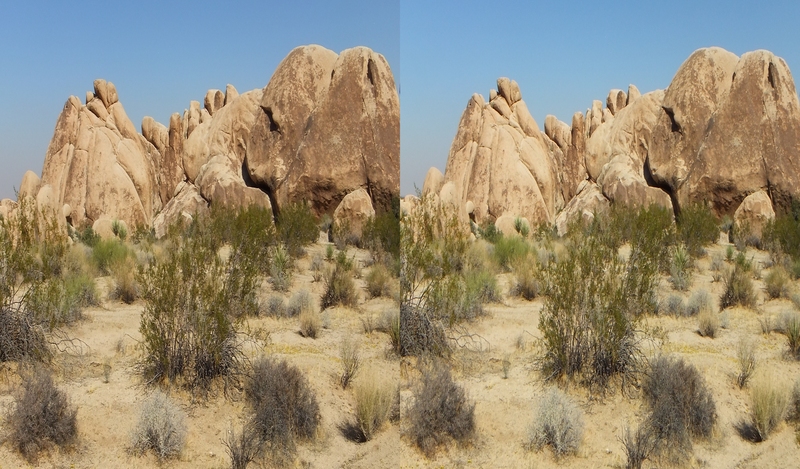 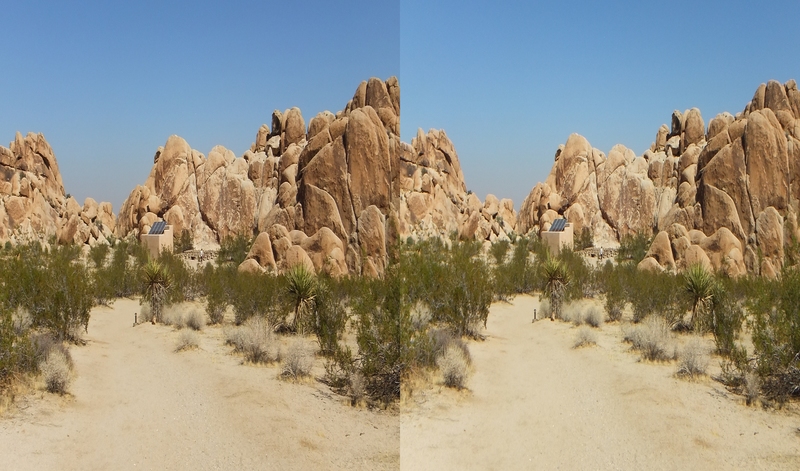 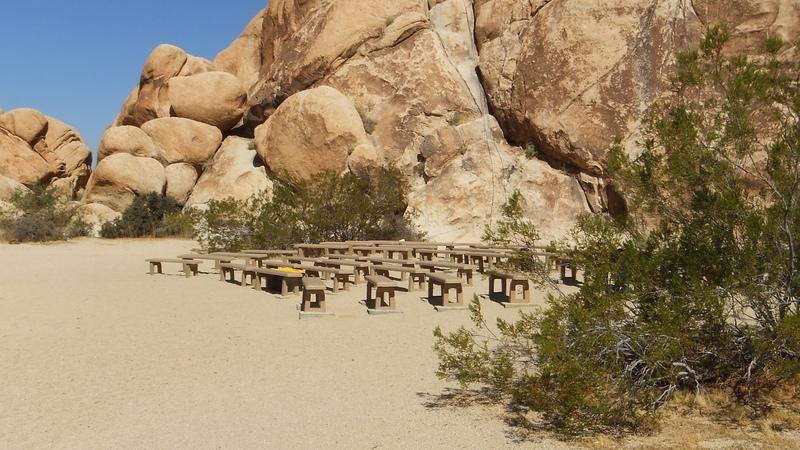 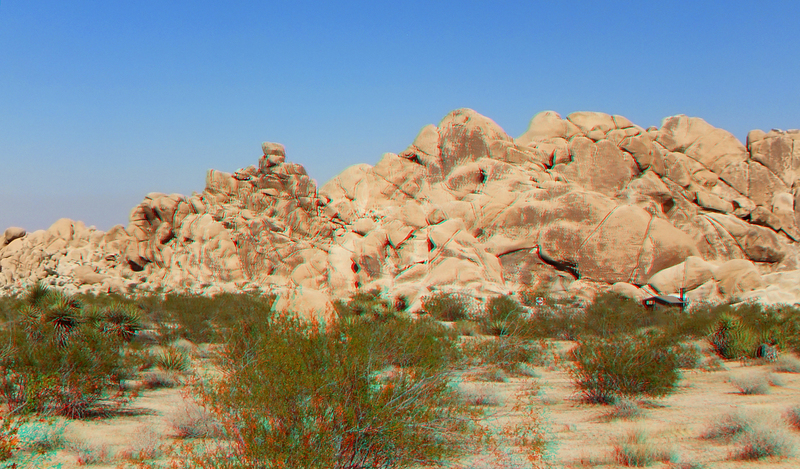 Thank you for visiting the Camp Entrance Galleries at Indian Cove and I hope you enjoy your visit to Joshua Tree 3D.